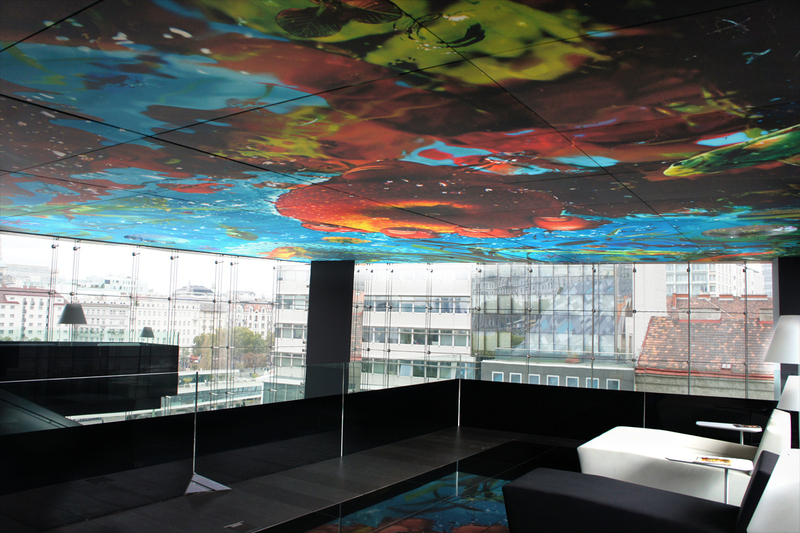 Located along the banks of the Danube canal, the Sofitel Vienna Stephansdom is rightfully described as a living work of art. 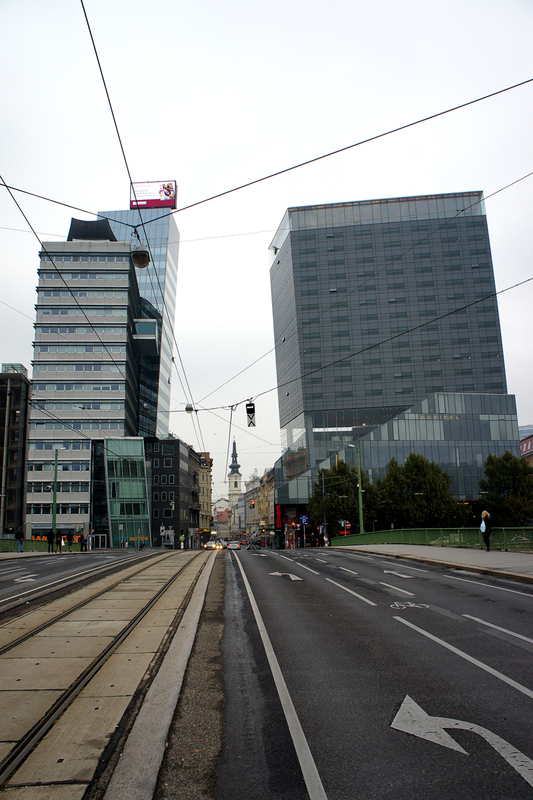 All geometric slants and angles, the building appears sloping, as if to give its neighbor a peck on the cheek. A skyscraping structure of sleek glass paneling, this spunky hotel designed by French architect Jean Nouvel is a contemporary haven. 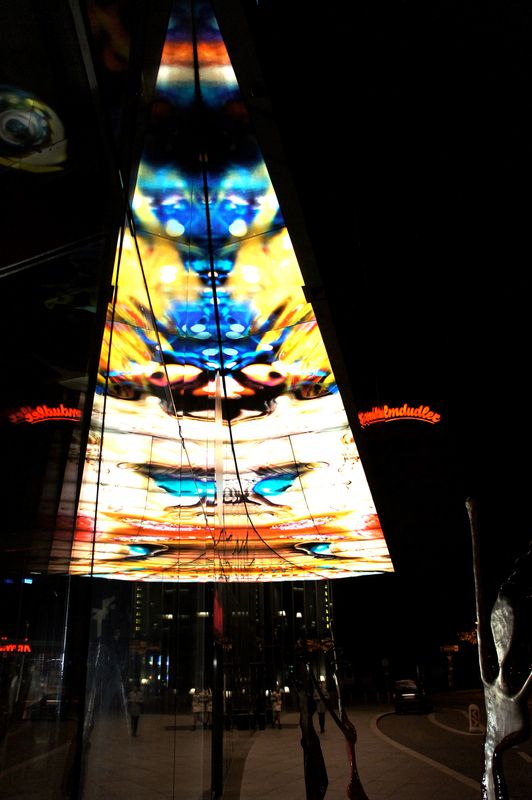 From the onset as you enter the hotel – your eyes are drawn to the illuminated ceiling, and you know immediately that it’s going to be a very special stay. 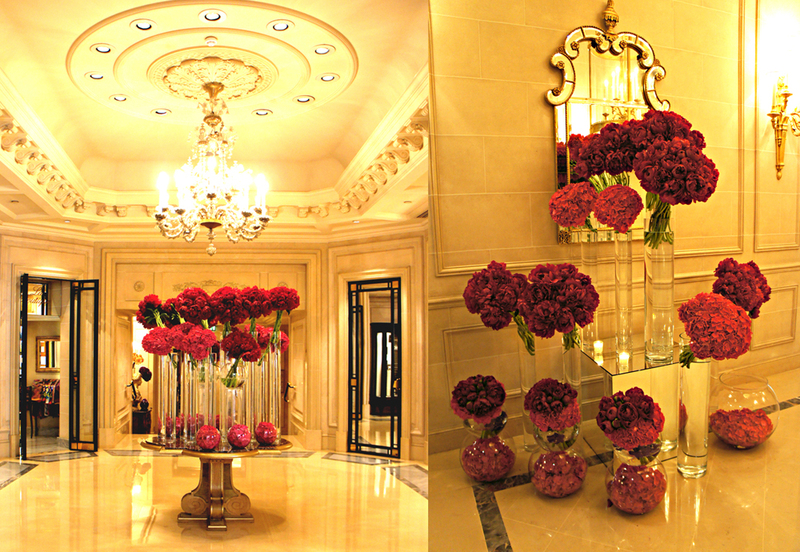 The first ‘bonjour’ of the day comes from the handsome bellman as he ushers us inside. The check in (preceded by quite a few more ‘bonjours)’ is seamless, but since our room was not yet ready, we are taken on a guided tour of the spa and fitness area. Presented with two exotic fruit smoothies, we perch awkwardly, fully dressed, on the enormous white geometric loungers in the spa’s relaxation room for a few minutes before we were quickly whisked away to our suite on the 15th floor. 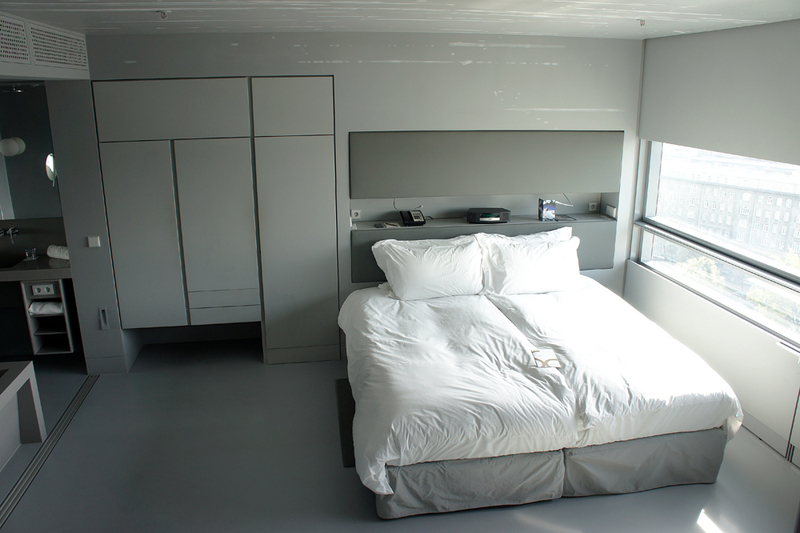 Jean Nouvel chose three monochromatic palettes for the rooms; black, grey and white. Our room happens to be grey. And I mean really grey! The floors are grey, as are the walls. 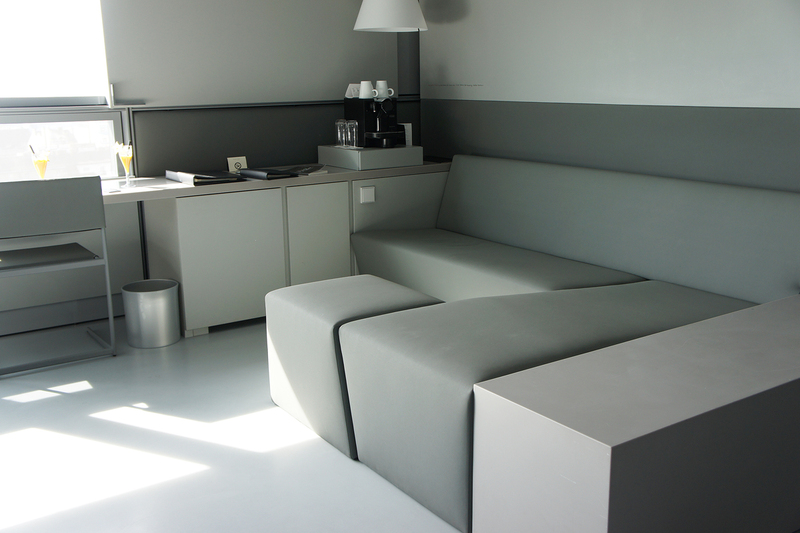 The bedside cupboards are grey, the desk and chair are grey, the large modern seating area is, yep, you guessed it: grey. 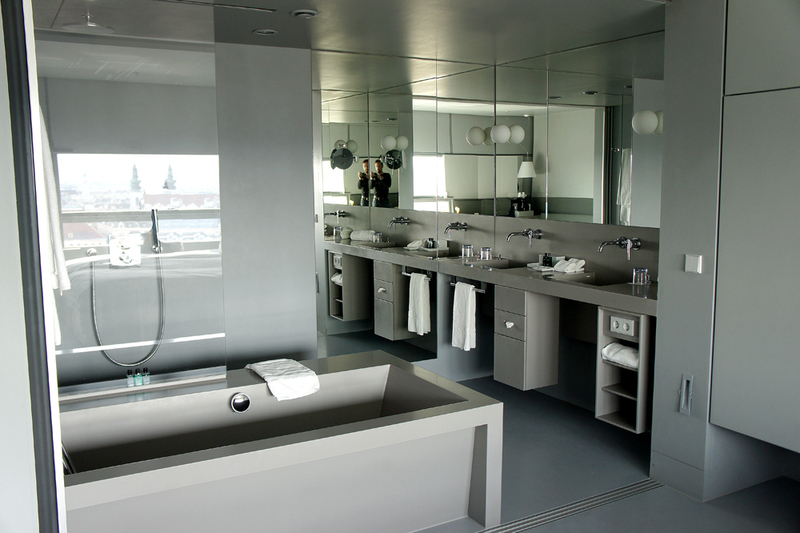 The bathroom comprises of a walk-in shower, large rectangular bathtub (grey, obviously) and his and hers vanities (also grey!). 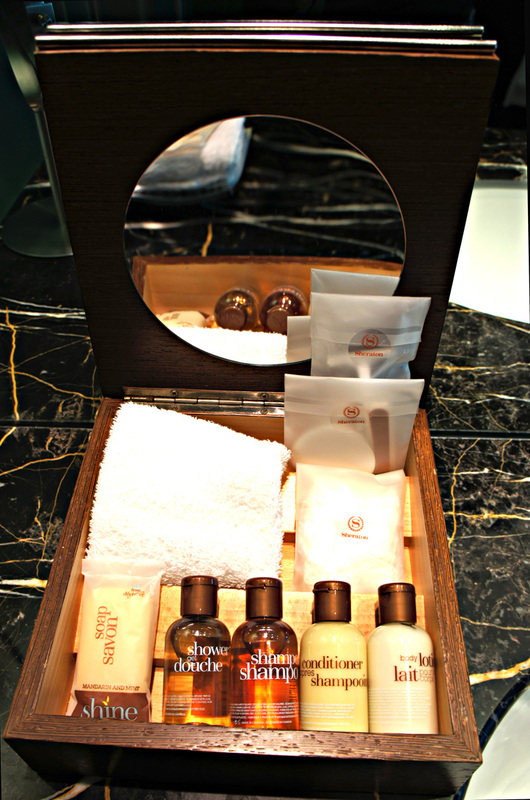 We find an abundance of sumptuous Hermès bath products and well appointed toiletries including a nail kit. Looking back I can see that the monochrome design may not be everyone’s cup of tea, but we loved it. 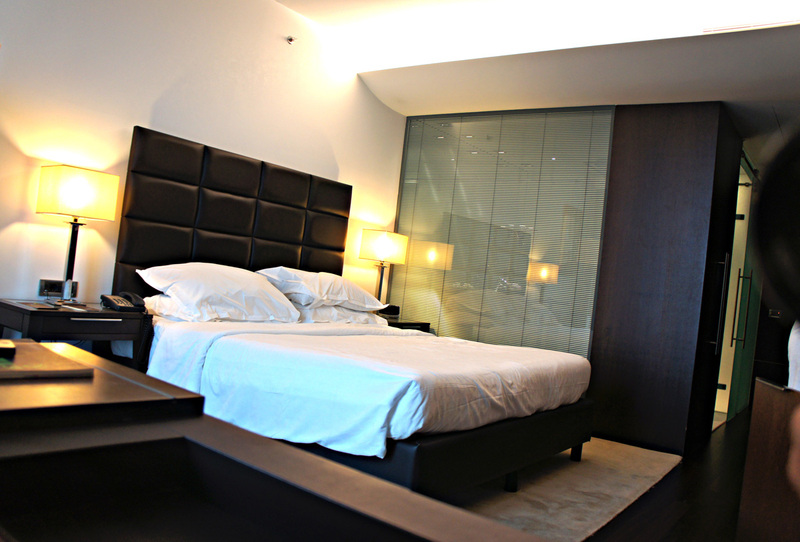 The room was sleek and modern, well designed and spacious. 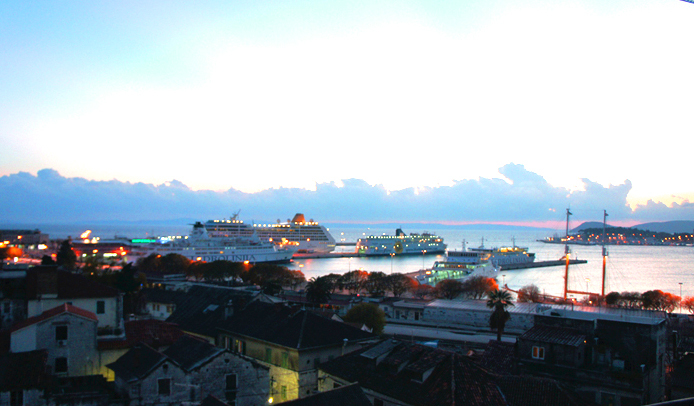 You would think the best part would be the view; staring directly over the canal and onto St. Stephen’s Cathedral. Even the (grey) window blinds could be geometrically opened to allow you to select the size of your window depending on your mood. But no, the best part for me was the SoBed. A celebration of all that is heavenly, this bed is virtually indescribable. But I’ll try: It’s large. So large in fact that it’s easy to lose yourself amongst its pillowy softness. That secret of that softness? The SoBed’s additional layer of plush called the ‘Featherbed’ that lies on top of the SoBed, creating that ‘sleeping on a cloud’ feeling. Along with a pillow menu of various choices (synthetic or real down) and a crisp white duvet, it made for the comfiest bed in the whole entire world. That evening we slip on our waffle robes and head for the spa. Not exceptionally large for a hotel of this size, the spa area is nevertheless as sleek and modern as the rest of the hotel. 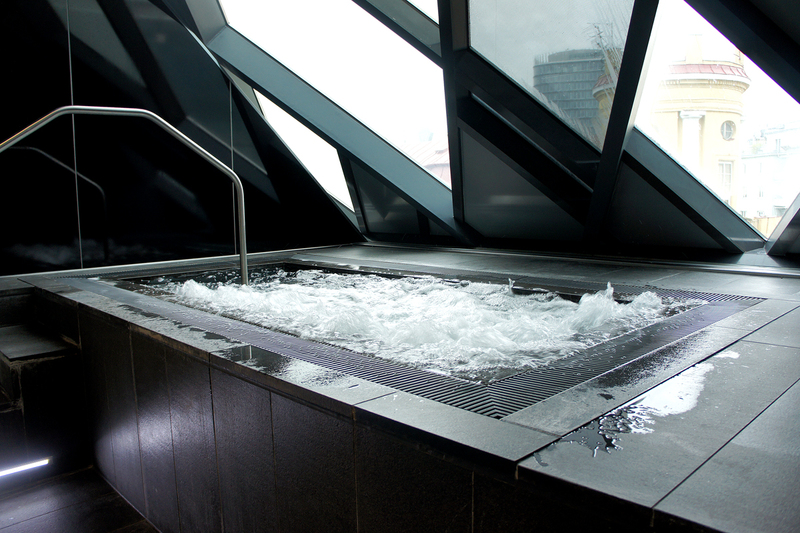 Two black slate Jacuzzis are bubbling quietly on either side, surrounded by large slanting windows. 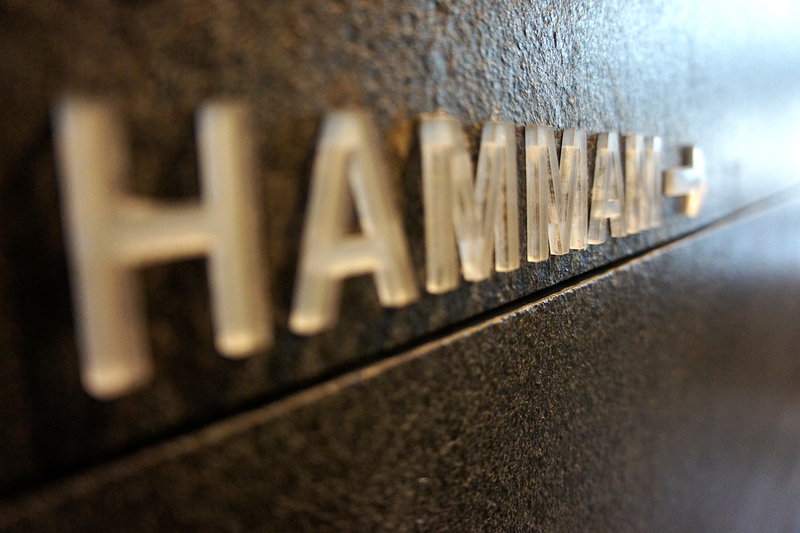 There are two hammans filled with eucalyptus steam. The atrium houses a relaxation area with aforementioned geometric loungers, while a state of the art gym caters to those so inclined. 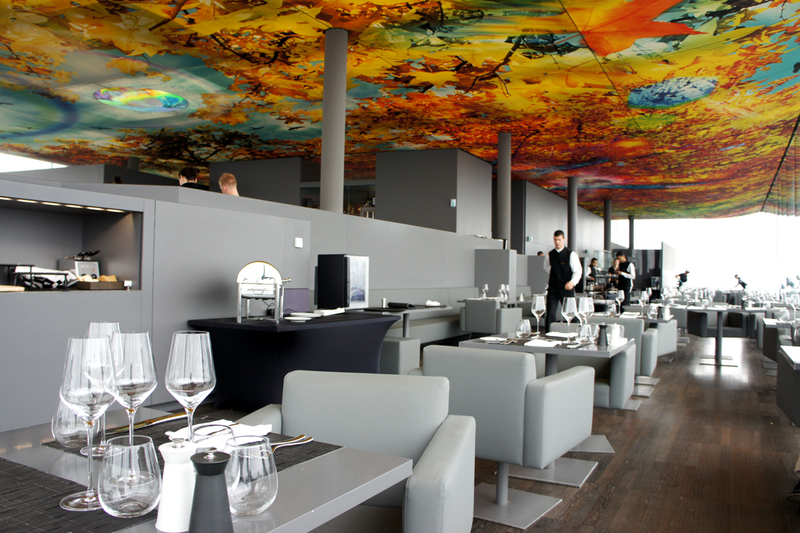 We eat dinner at the hotel’s famed Le Loft occupying the 18th floor, and have the most memorable meal in the glamorous restaurant whose chef was awarded three Michelin stars. You can read about that experience here. 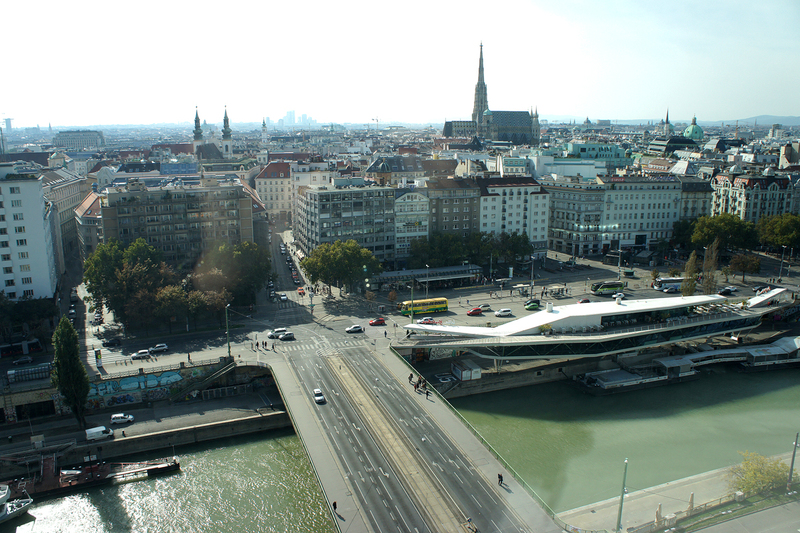 The location of the Sofitel Vienna Stephansdom could not be more perfect for visiting the city’s sights. Its namesake, St Stephan’s Cathedral, only a short walk away, and other major attractions are easily reached by foot or public transport. 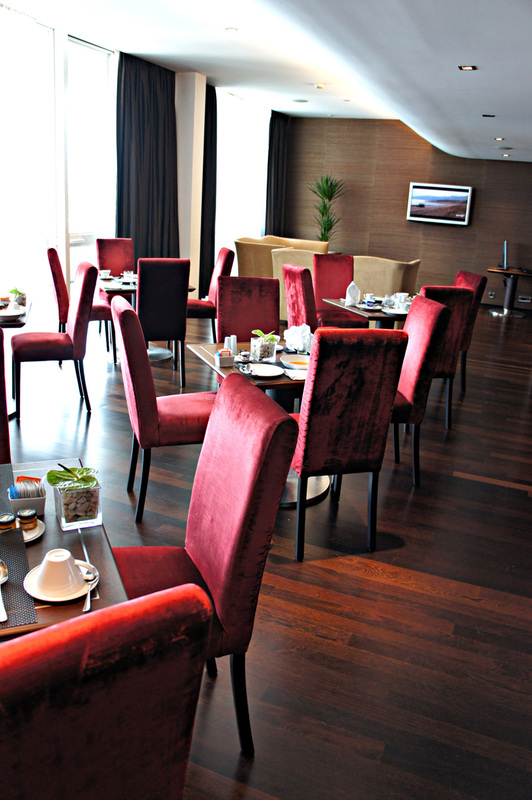 Breakfast is a casual affair, also served at Le Loft. 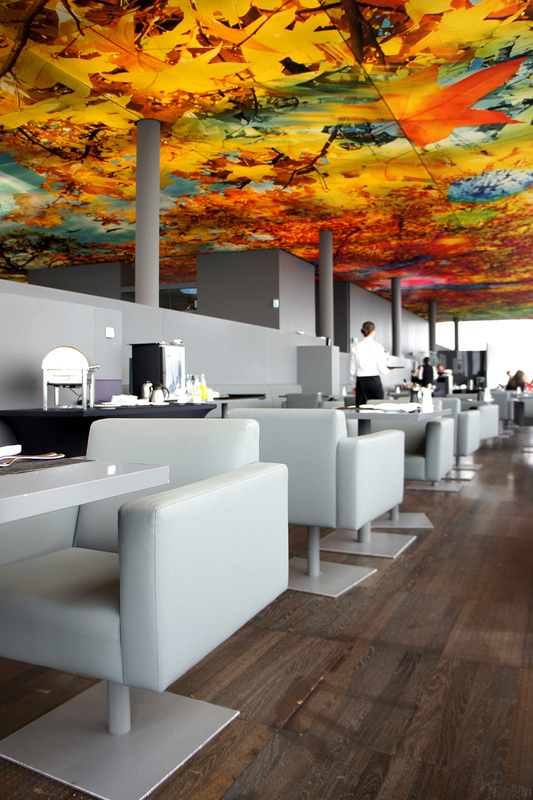 The restaurant is starkly beautiful by day, the views just as impressive without the golden glow of the ceiling’s illumination. We enjoy fresh mixed berries, Greek yogurt and honey; followed by deliciously cooked scrambled eggs on seeded bread rolls. 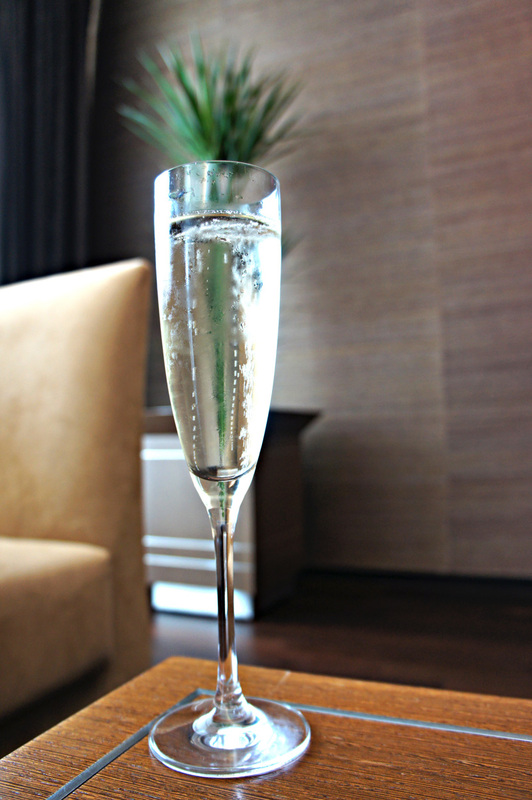 Sipping on French-pressed coffees and flutes of champagne, we take in the stunning 360° vistas le Loft offers. Again that evening after a long day of sightseeing, we head to the spa to unwind and relax. A full range of spa treatments are on offer (at a fee), and while I’m tempted by the 24 carat old massage, due to time constraints, I reluctantly refrain from making a booking. 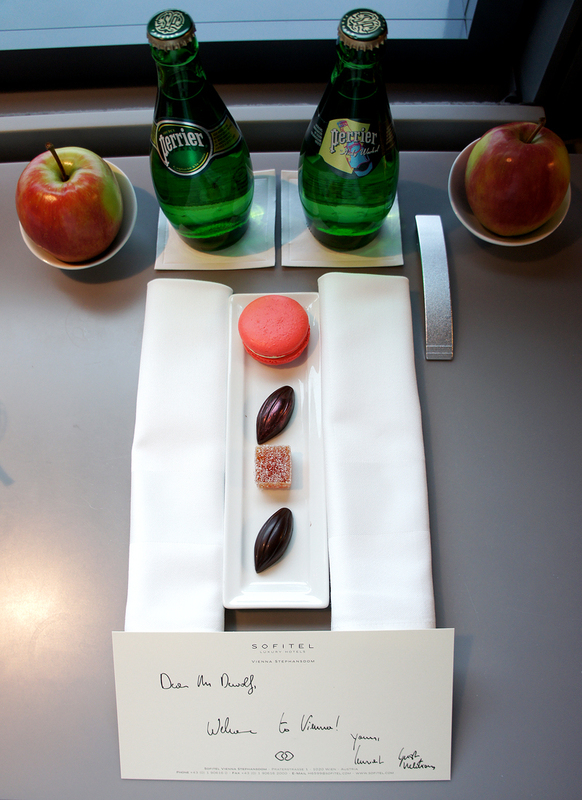 We dine in-room, and the speed and quality of room service is exceptional. My order of risotto arrives piping hot, with a fresh bread basket, butter and condiments. The room service prices are outstandingly good value for a hotel of this standard. Of course, wifi is complimentary, and we never had any issues, irrespective of the number of gadgets we connected. But for me, perhaps the most enduring memory of the Sofitel Vienna Stephansdom is hotel’s façade at night, with the two illuminated ceilings creating a breathtaking silhouette after dark. 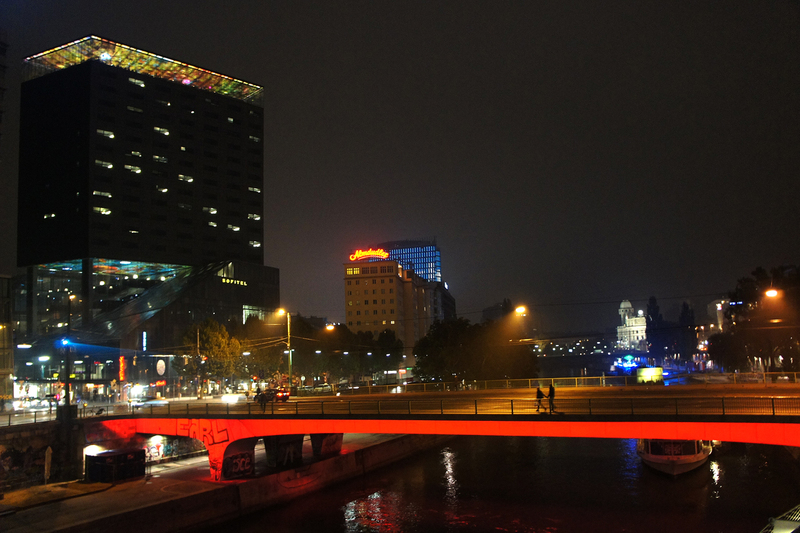 Each evening after dinner we head out and stroll along the canal to admire the hotel’s design. Two days later, when it’s time to check out I have to dig deep and find superhuman strength to leave the blissful cocoon of the SoBed. 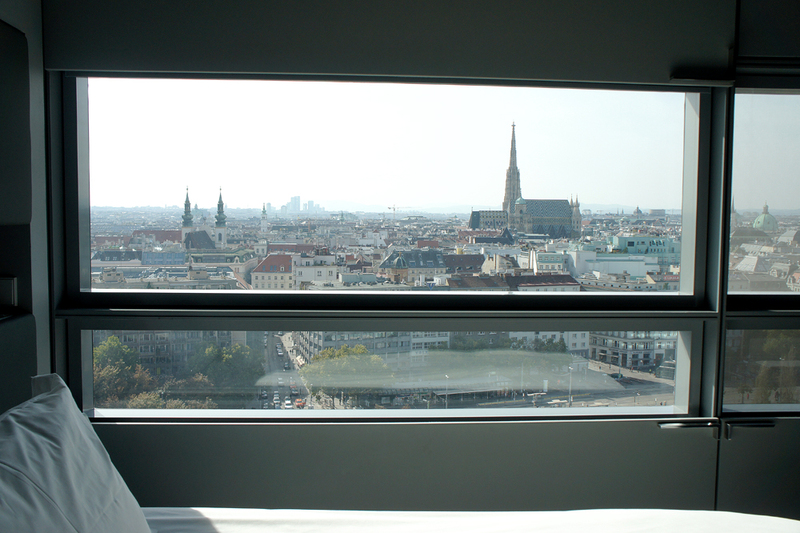 All in all, the Sofitel Vienna Stephansdom is one of the most spectacular hotels I’ve stayed at. 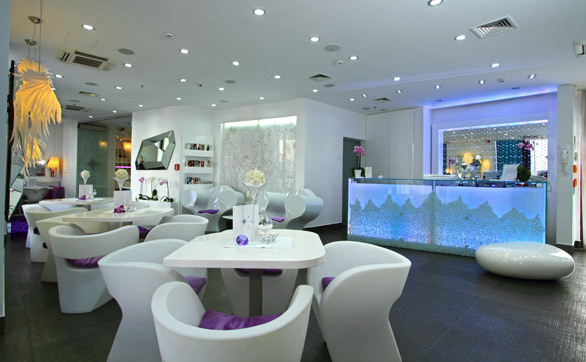 The service is second to none and the daring design and glamorous details will surely see us heading back in a few months (and this time I will ensure enough time to experience the spa treatments!). 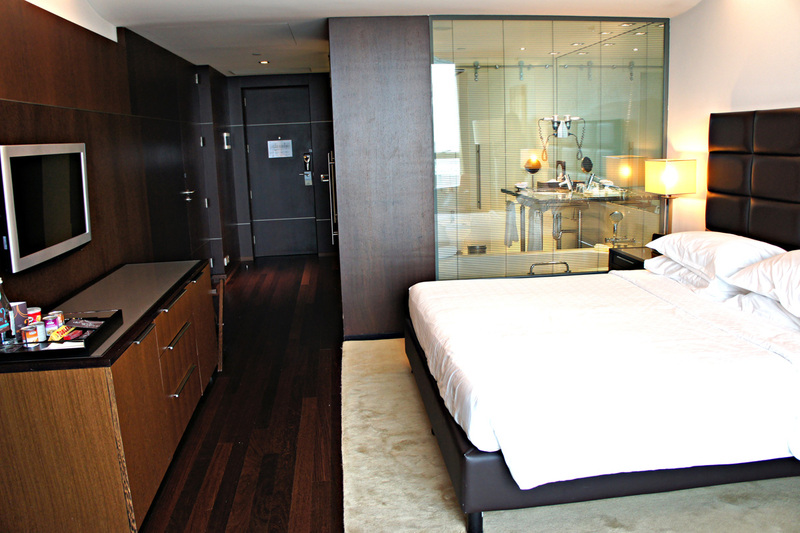 The prices are as expected, hardly cheap, but for those seeking contemporary luxury in the heart of Vienna, for whom great service is non-negotiable – the Sofitel Vienna Stephansdom is well worth the indulgence. Rates from 200€ to >3000€. For more information and special offers, visit the hotel’s official website. The Sheraton Porto Hotel and Spa is a 5-star oasis of tranquility in Porto, a short metro/taxi ride from the city’s attractions. 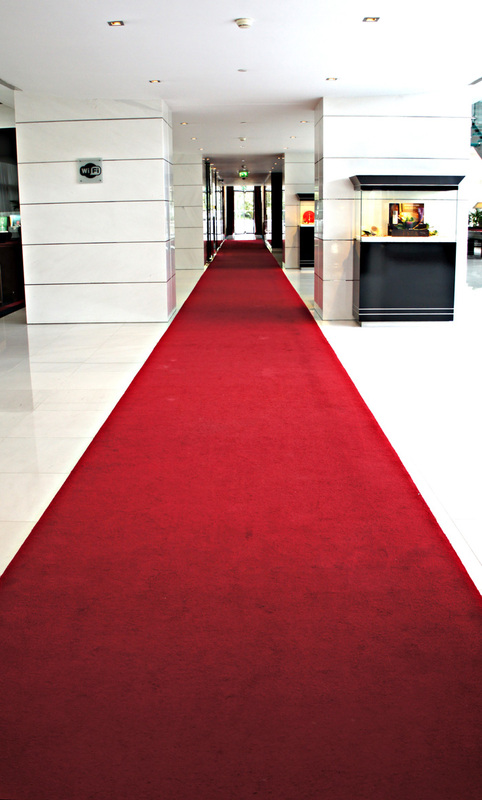 The modern steel and glass structure sits in the heart of Porto’s business district, and from the moment you set foot onto the red carpet, you know you’re on to something special. 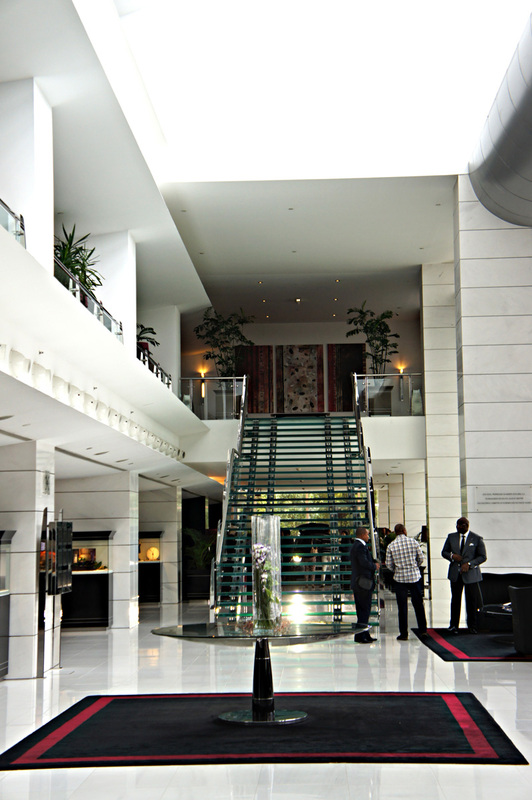 We arrived earlier than anticipated, and of course, check in was not for hours yet, but the very accommodating reception staff ensured that our luggage was whisked away, we were given temporary room cards and shown to the club lounge on the 12th floor. Here we enjoyed a drink and caught up on emails thanks to the high-speed, complimentary wi-fi. 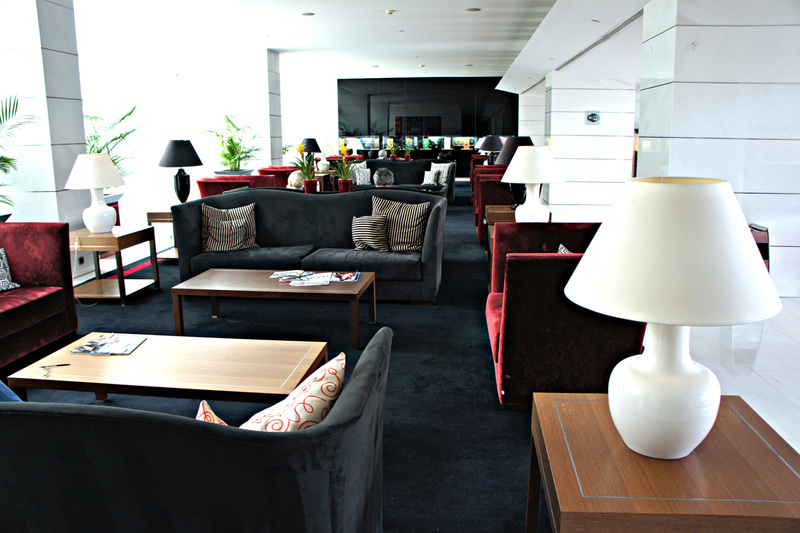 The club lounge is an access-limited feature of the Sheraton hotels, giving club member (or guests staying at the club floors) some additional perks such as complimentary internet access, and the privilege of using the club lounge. 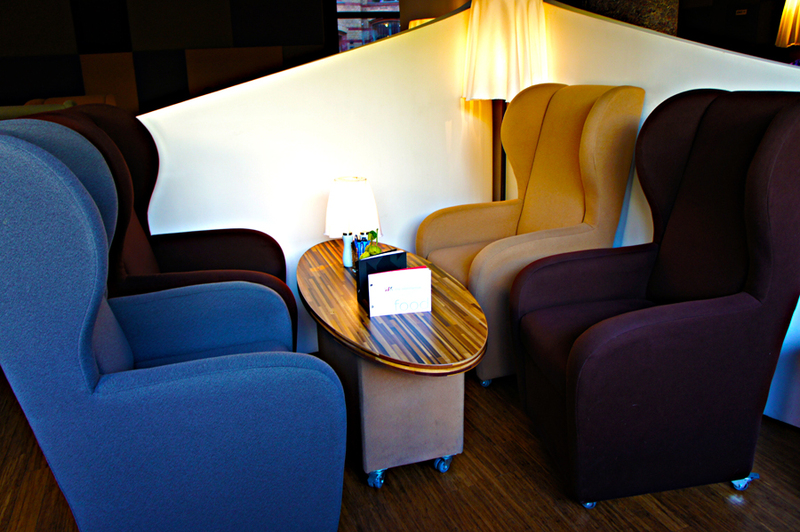 In the lounge, you find a little relaxation space, with comfy couches, a computer with printing facilities, and a large screen TV. 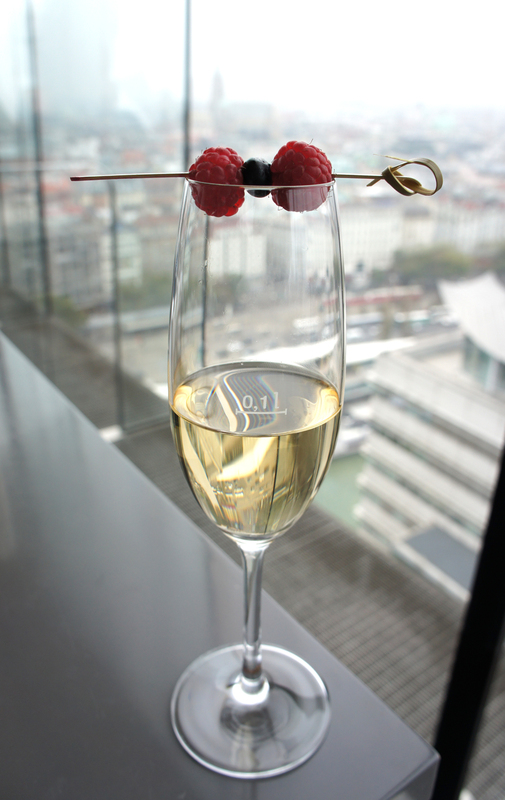 There are complimentary snacks throughout the day, and we enjoyed an aperitif each evening before dinner of Porto’s signature drink; Port wine. 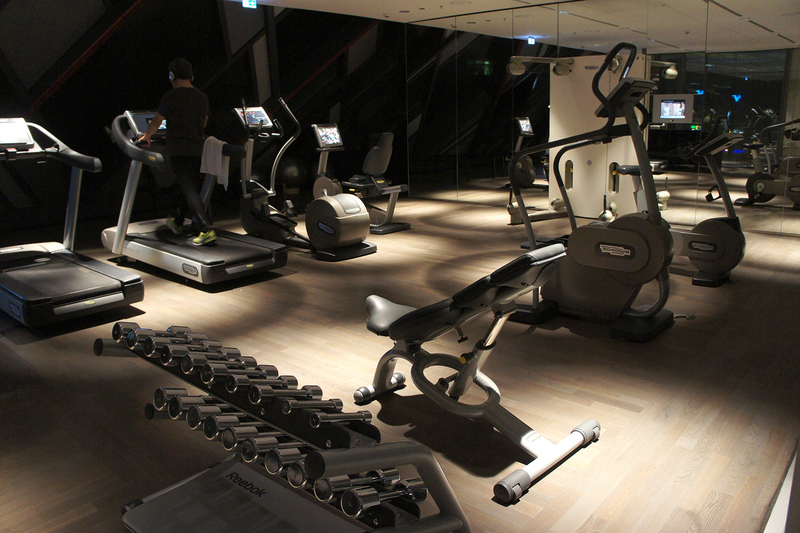 The club rooms are also typically positioned on higher floors, ensuring sweeping views over the city. 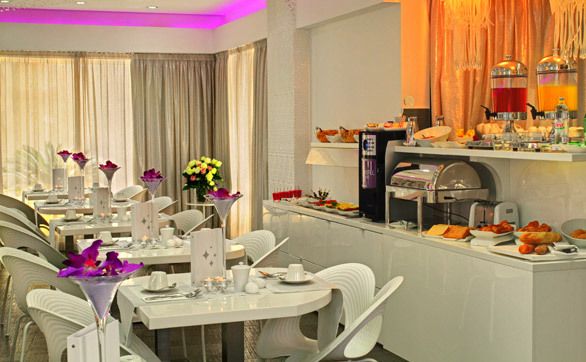 Club members can also choose to have breakfast in the lounge, although I wouldn’t recommend it if your stay already includes breakfast, as the Porto Novo restaurant, in my opinion is a far superior option. But more on that later. After spending about an hour and a half in the lounge, I went back to the reception to enquire about the availability of our room. 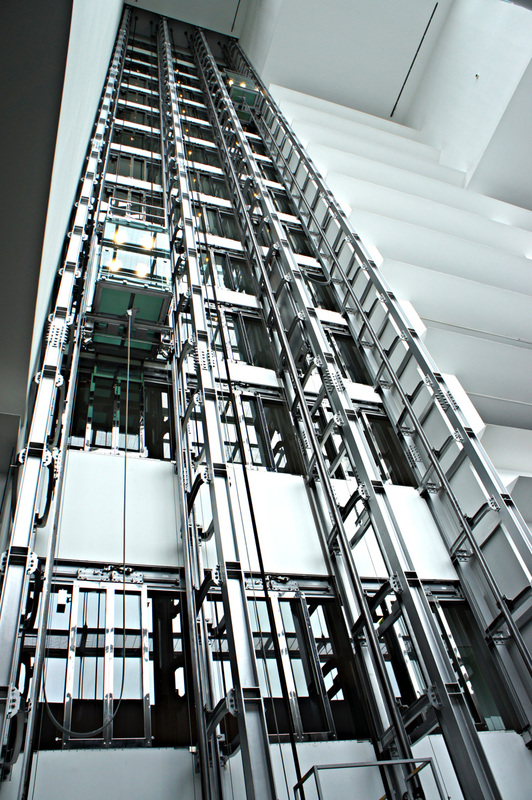 I must add at this point, the elevators in this hotel are truly amazing. So speedy, and so silent, I often got the buoyant feeling of being on a Disneyworld ride each time I went up to the room. By this time, our room was ready, and we headed up to the 10th floor, to find our luggage had already been placed inside. The room was large, airy and bright. 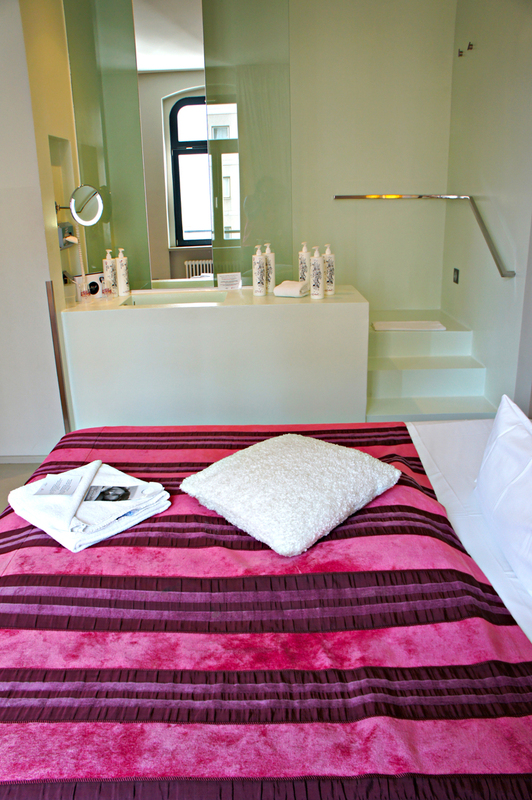 Faultlessly clean with white linens, and plenty of soft towels. 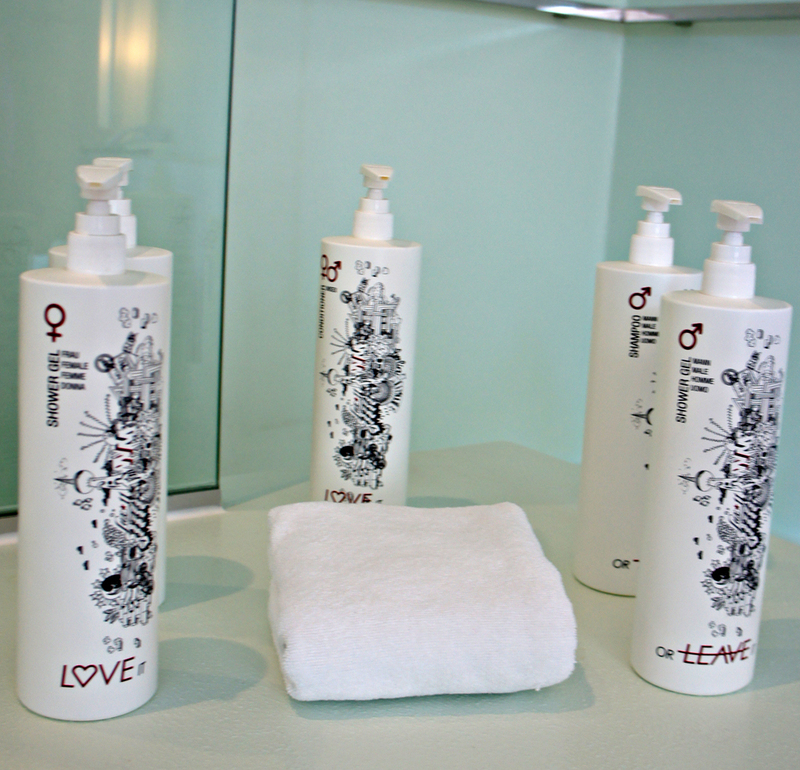 I found delicious smelling toiletries, the same ones we’ve had at previous stays at Sheraton. However, there was no little bottle of mouthwash this time – I am not sure if they have decided not to leave these in the rooms anymore? There was plenty of closet space, and we quickly unpacked the essentials, getting the suitcases out of the way. It had been a long week, and seeing as the weather was grey and dull, we headed to The Spa to enjoy the heated pools and saunas. 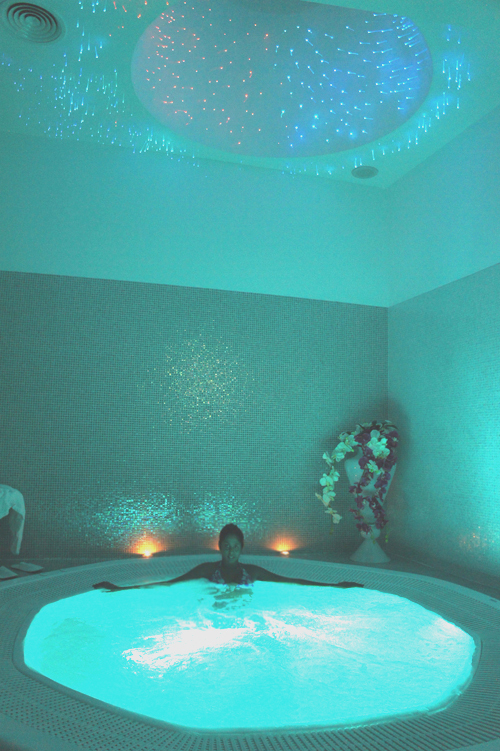 (I’ll be writing a post on our amazing spa experiences soon). We spent the rest of the afternoon relaxing on the comfy day beds in the spa, before heading into the historic city centre (UNESCO World Heritage site) for dinner. The Sheraton Porto Hotel and Spa is not a small hotel – with 12 floors and over 260 rooms, but the level of service we experienced at the hotel was second to none. I loved the décor, from the use of modern glass and steel that merges effortlessly with the more traditional wood and marble. Our room was quite large and the king size bed was super comfy. We found enough plug sockets for 2 iPads, both our phones, and a camera, all conveniently located – without having to move a couch or unplug a lamp. 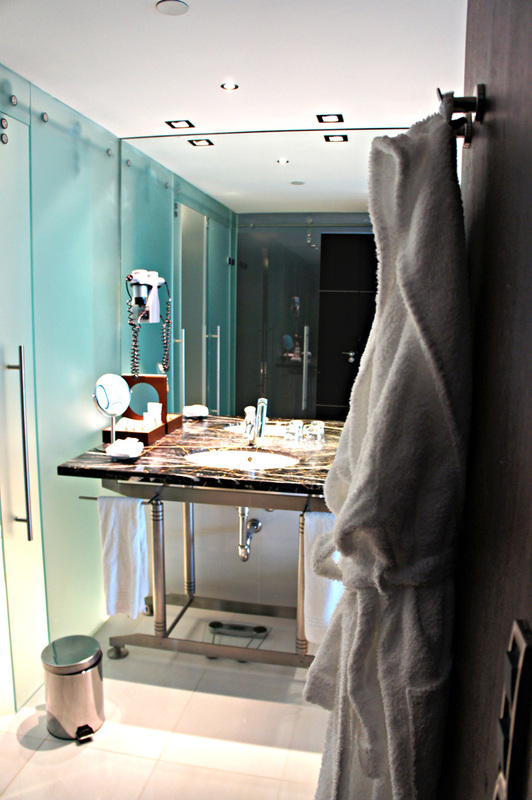 The bathroom was big and wonderfully lit – not the type of hotel where you needed to squint around in a dimly lit space to apply your makeup. 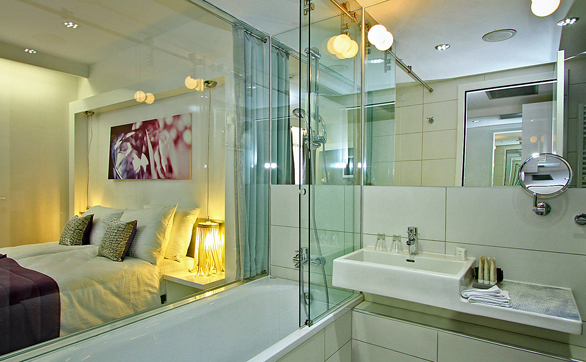 His and hers sinks was convenient, and the ample-sized bathtub was a draw card which faced the room via a glass wall. 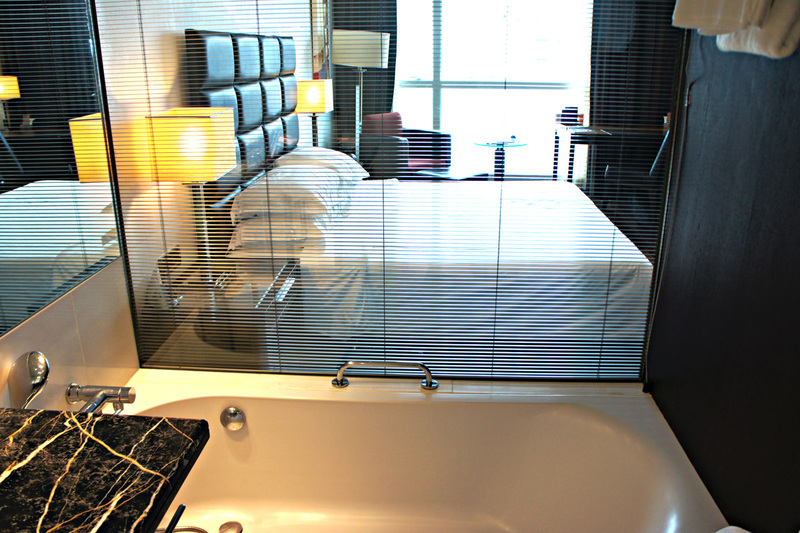 But if you’re not travelling as a couple, fear not, there are blinds that can section off the bathroom to ensure privacy. 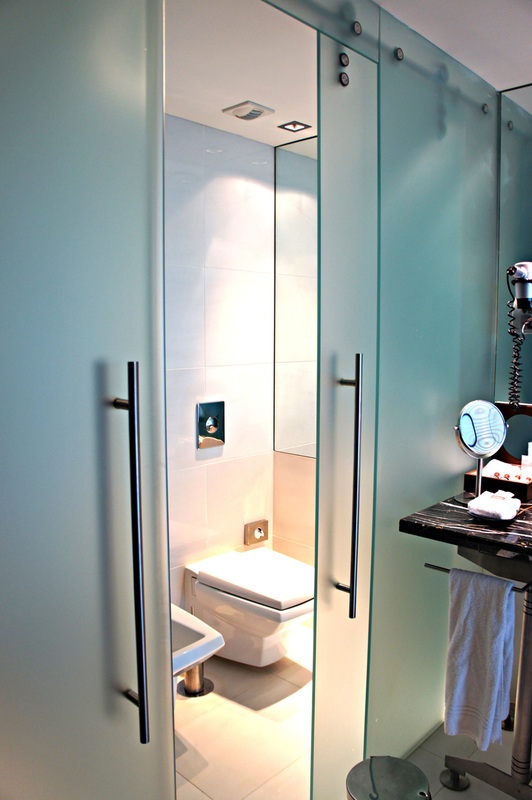 There is also a separate shower and a separate toilet –which I appreciate. 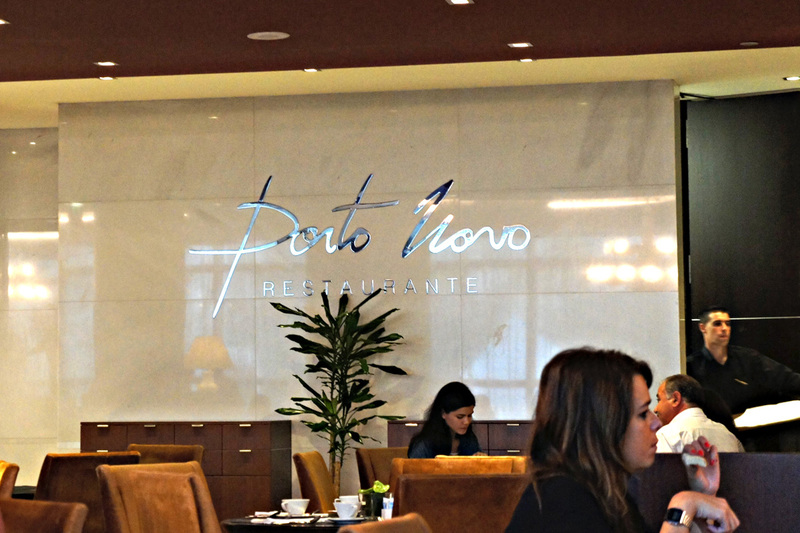 The next morning we enjoyed a spectacular breakfast at the Porto Novo restaurant on the lobby level. I loved the breakfast at this restaurant because the food choices were so vast (both hot and cold options) with everything from fresh fruit to made-to-order eggs and omelets. I enjoyed pancakes one morning topped with fresh berries and drizzled in maple syrup. A mimosa added to the relaxing feeling of being on holiday. The reception staff were ever-willing to hand out maps and point us in the right direction for all the city’s major sights. And after a long day of sightseeing, battling the famous Porto winds a little bit, we welcomed the opportunity to return to our luxurious room ach afternoon, slip into our swimsuits and decompress in the Jacuzzi. 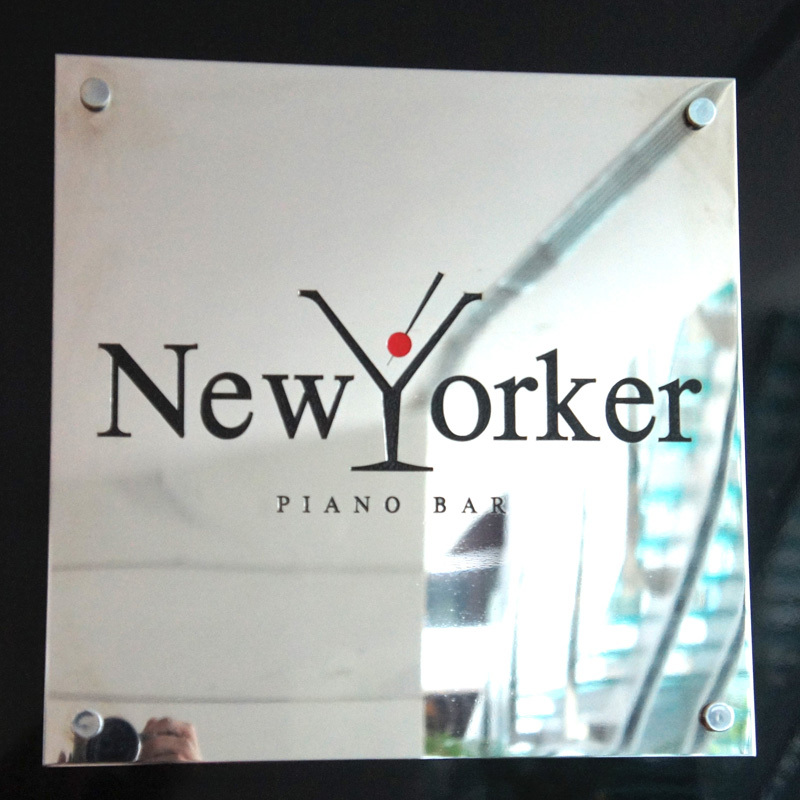 The New Yorker bar located in the lobby is the ideal spot to enjoy a cocktail or three, as the soothing sounds of the grand piano envelopes the room. 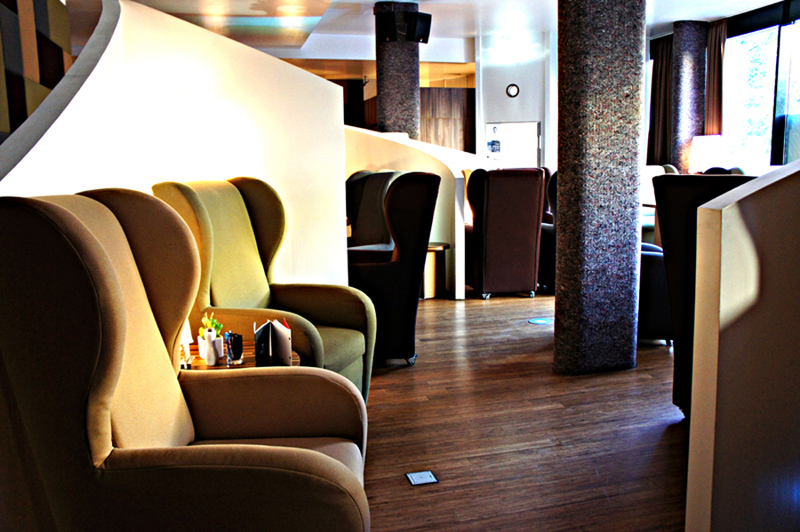 Plush carpeting, richly textured couches and expertly mixed drinks all add to the feeling of glamour. All in all, I found the Sheraton Porto Hotel and Spa to be the perfect hotel in Porto, whether you’re travelling for business or leisure. The location may not suit everyone, particularly those wishing to stay in the historical centre itself, but I found the location perfect for sightseeing, and enough removed from the city hub to give a sense of calm. 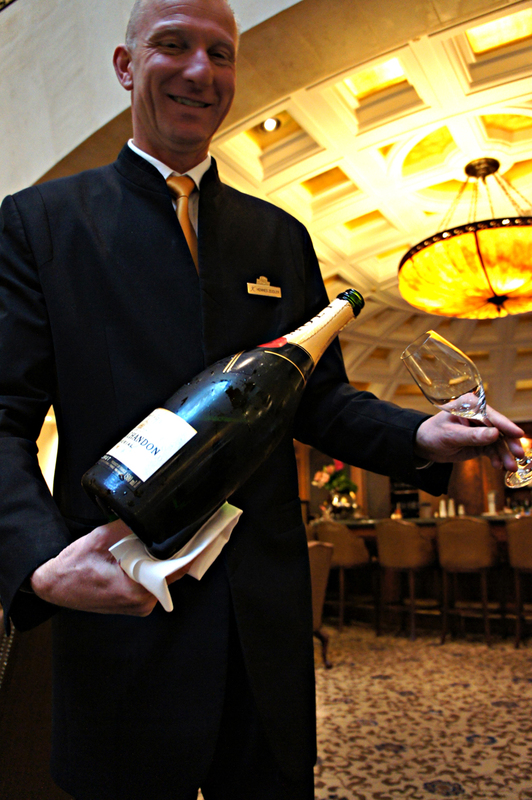 The level of service is what one would come to expect from a 5 star establishment: courteous and highly efficient. 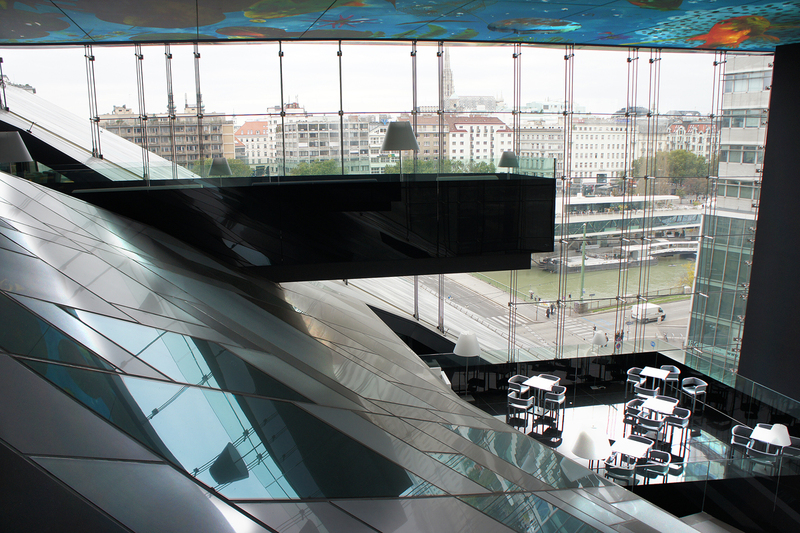 The design of the hotel itself is impressive, and the imposing all glass façade is a feast on the eyes. I would not certainly hesitate, for a second, to stay the Sheraton Porto Hotel and Spa when in Porto again. 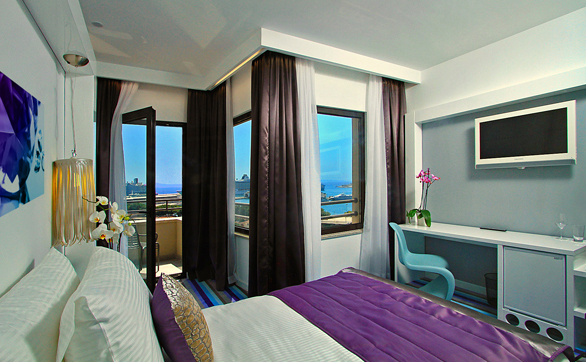 Rates from 90€ for a deluxe room, to 2000€ for the presidential suite. 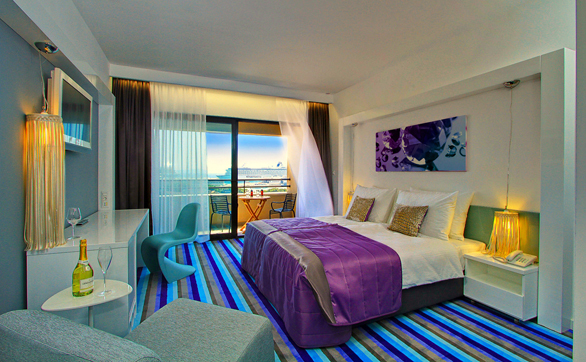 Club rooms rates begin at 156€. 1 Night spa packages from 190€ pp sharing. For more information and specials, please go to the hotel’s official website. 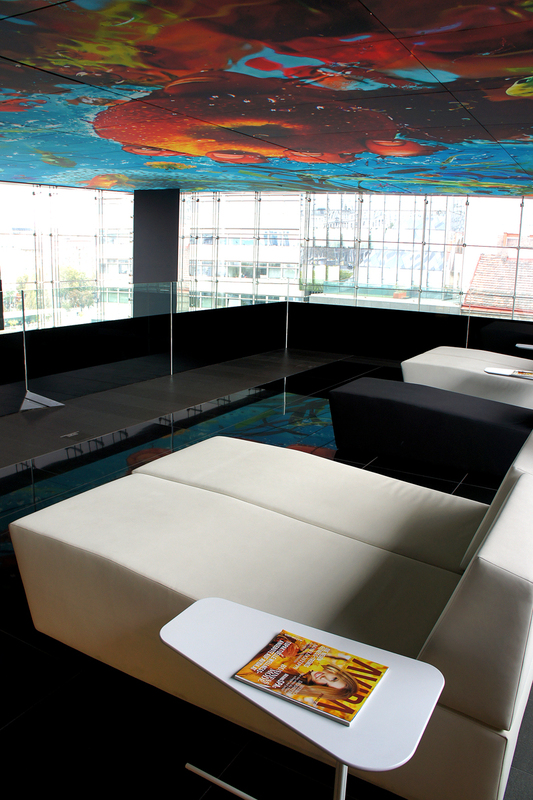 Disclaimer: We received a complimentary upgrade to club level at the Sheraton Porto Hotel and spa. All opinions expressed in this review however, remain completely my own. What do Albert Einstein, Charlie Chaplin and Michael Jackson all have in common? Well, they were all guests of the Hotel Adlon in Berlin. Not at the same time, of course – although that would have sure been something! 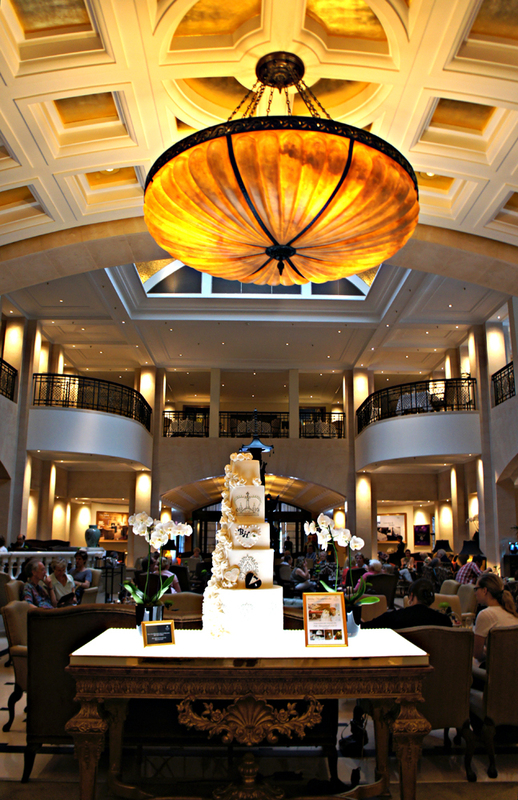 The Hotel Adlon is one of the most famous hotels in Germany, if not Europe itself. The hotel survived both the first and second World Wars, only to be gutted by a fire mere days after WW2 had ended. 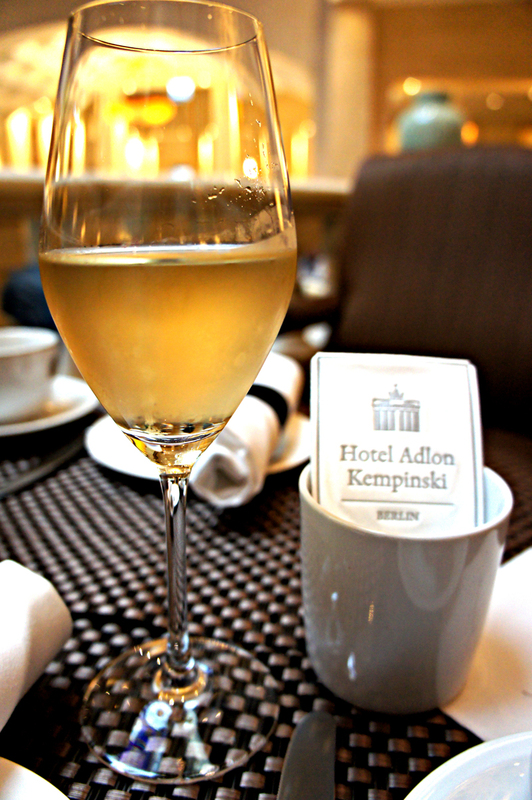 But like a phoenix rising from ashes of the old, the Adlon was rebuilt shortly after the reunification of Germany, and now operates as part of the luxury Kempinksi Hotel chain. 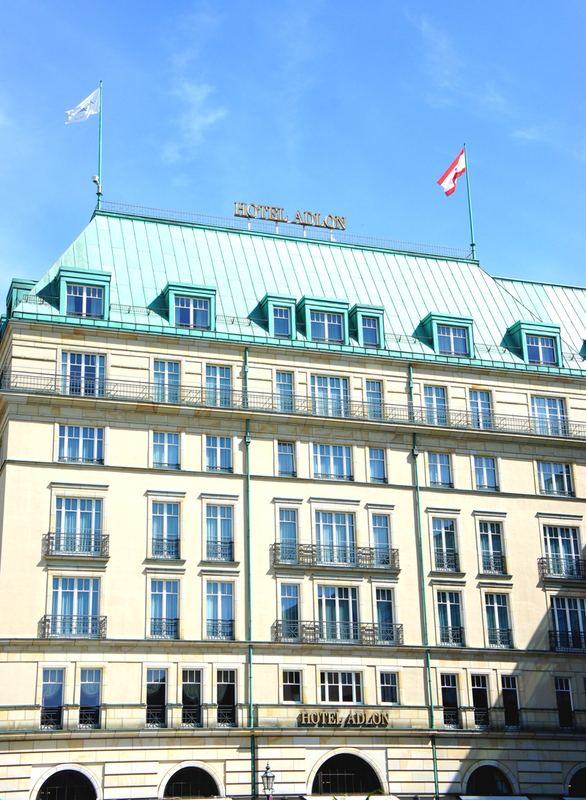 The Adlon’s history is vast, rich and somewhat chequered; yet in modern-day culture, it is primarily known as the hotel from which Michael Jackson notoriously dangled his then-infant son Blanket from the hotel’s balcony, in a somewhat misguided attempt to debut the baby to the hordes of screaming fans outside. 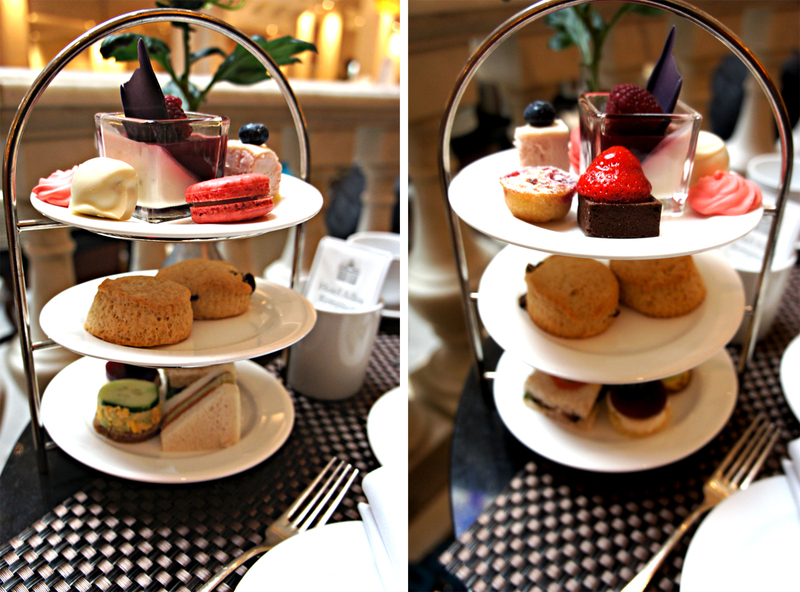 If you read my blog regularly, you’ll know that I do love a good Afternoon High Tea (proof here, and here). There is just something about the elegant British tradition that I absolutely adore. So, on a warm summer’s day in Berlin, I made my way over to Pariser Platz to enjoy afternoon high tea at this iconic institution. When I arrived at Berlin’s most famous square, the Brandenburg Gate took center stage, poised about a 100m from the hotel itself. Greeted courteously by the smartly dressed porters outside, I made my way along the same path that I presume Brad and Angelina strolled when they stayed at the Adlon, and into the hotel’s stunning lobby. 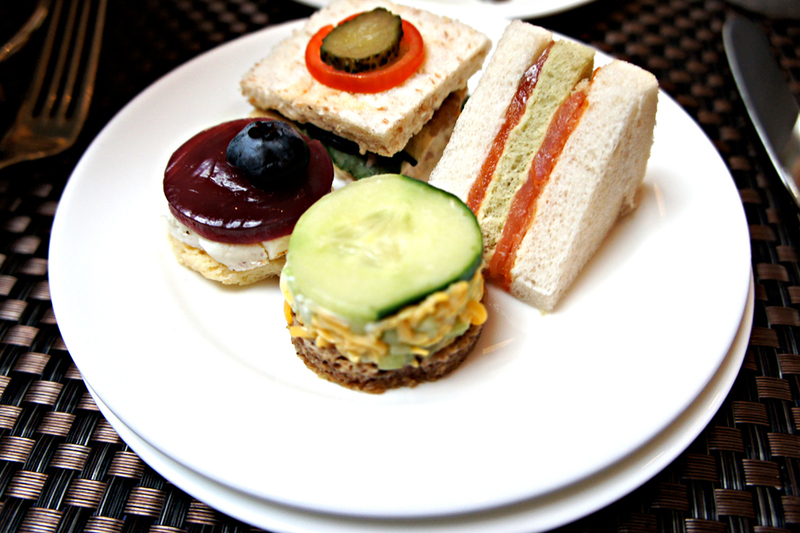 Afternoon tea is served in both the Lobby Lounge bar, and the Bel Etage (first floor lounge). Sophisticated clientele were seated around the Lobby Lounge, amidst thick conversations in German, Italian and French (from what I could decipher). There were young clusters of women enjoying the tradition of afternoon tea, businessmen in suits and colorful ties, and groups of families having a late lunch. I settled into a plush velvet chair and immediately succumbed to a friendly waiter proffering a chilled glass of Moët and Chandon – how could I resist? 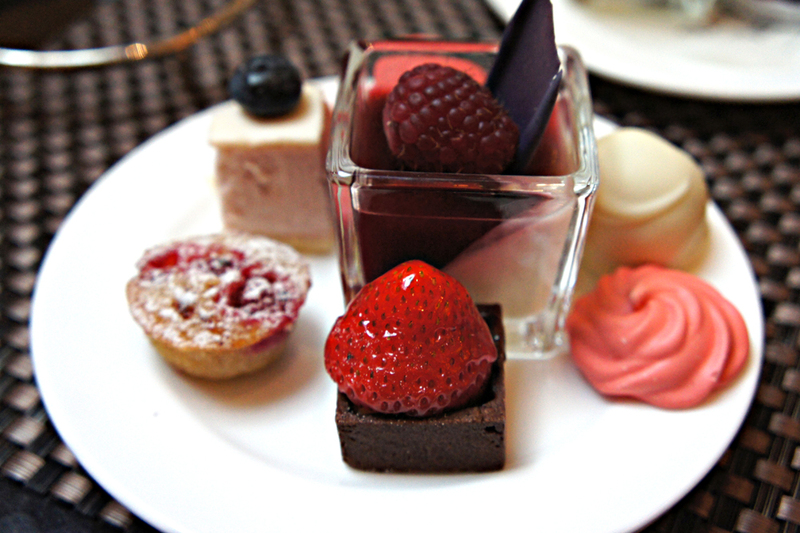 Having skipped lunch to fully appreciate the tea experience, I got to work on my three-tiered cake stand filled with delicious treats, as I took in the ambience of the hotel. 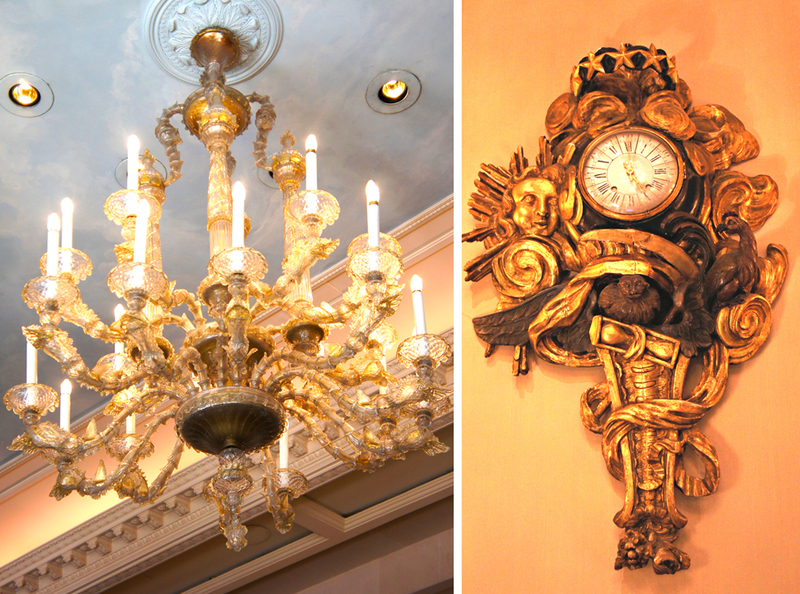 The style and décor can only be described as old-world charm. From heavy fabrics to imposing chandeliers, the impression of old-fashioned luxury in the lobby expands like the film set for the Great Gatsby. 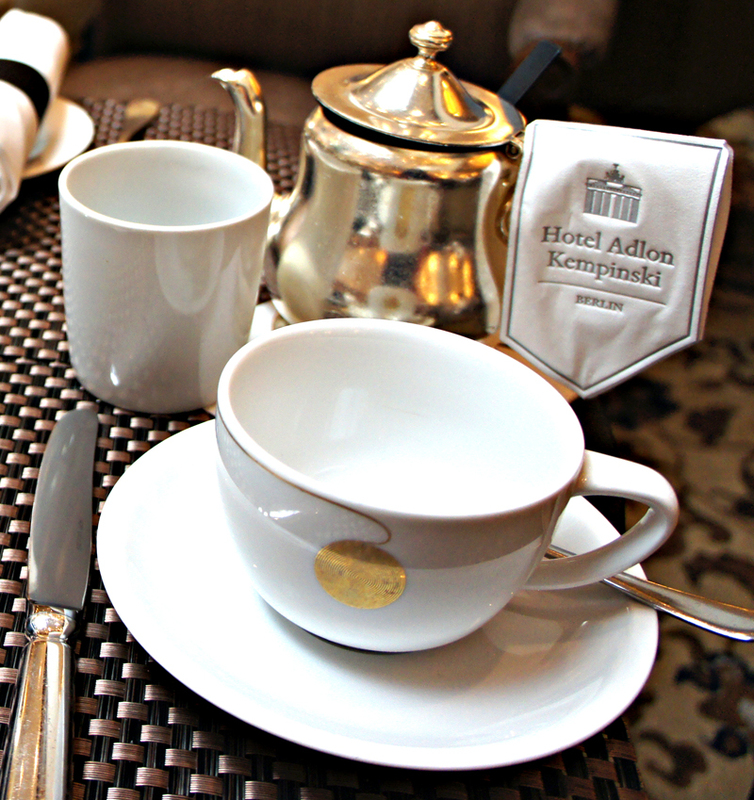 Again my mind drifted back to the Adlon’s illustrious guest book – Nelson Mandela, Franklin Roosevelt, Greta Garbo, and the Queen herself, have all enjoyed the hotel’s impeccable hospitality. Feeling rather special amidst the history and grandeur, I delved into the savory portion of my cake stand…several finger sandwiches displayed ever so elegantly . The quail egg and cucumber sandwich went down effortlessly well with the glass of champagne. 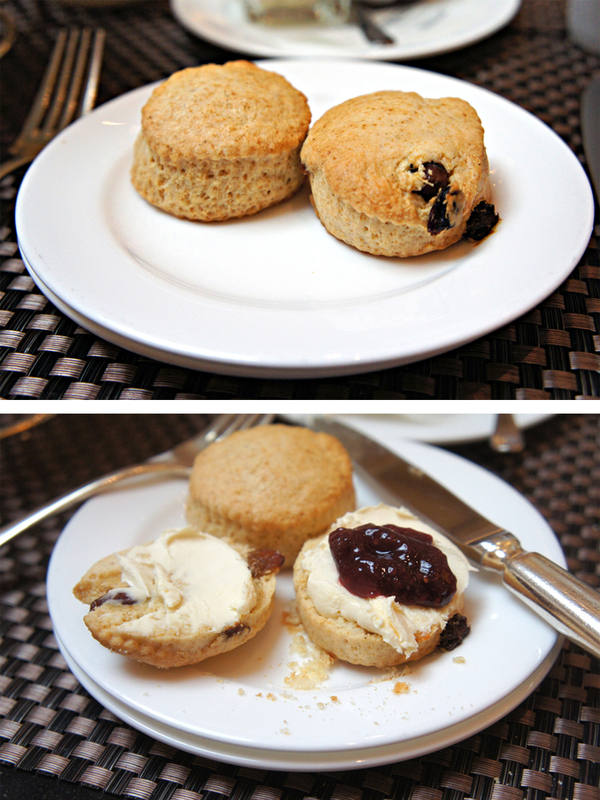 Then, as I smothered my scones in clotted cream and strawberry jam, I was somewhat disappointed in the rock-hard texture of the scones. Perhaps left a little too long in the oven, the scones were slightly harder than I prefer. Having chosen a delightful summer tea bouquet (named Granny’s Garden – a fruity rhubarb concoction with a hint of bourbon-vanilla), I sipped the delicious tea, poured from a real silver teapot. The hotel thinks of everything, even going as far as supplying a soft, monogrammed teapot holder to avoid guests burning their hands on the teapot, as silver can get smoldering-hot. By the time I arrived at the third and final layer of my tea stand, I was actually quite content to sit back, cup in hand and listen to the soothing sounds coming from the grand piano on the Bel Etage. If I closed my eyes, right at that moment, with the backdrop of hushed conversations and the tinkling of fine china floating around, it would have been easy to forget the present day and time, and simply slip into a bygone era where flapper dresses, wingtip shoes and fedoras were all the rage. But a white chocolate truffle with my name on it kept calling out, and soon the delicious burst of café-crème filled my tastebuds as the truffle was washed down with the last of the champagne. 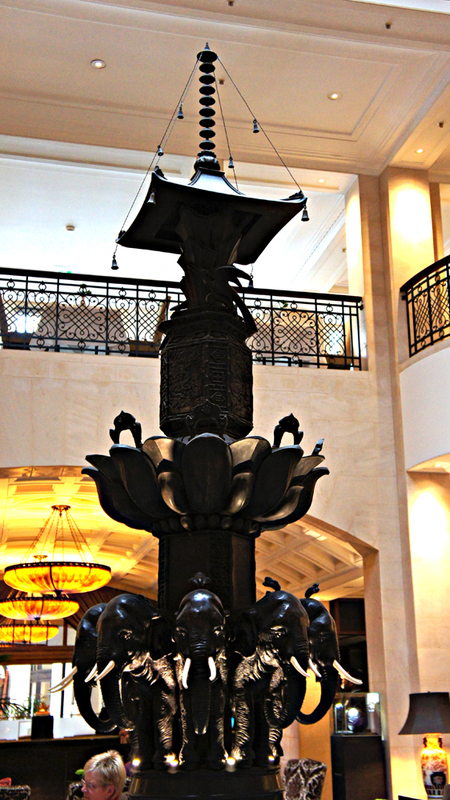 The sound of the central fountain in the courtyard of the Lobby Lounge was ever-present, adding a serene and calming ambience to the experience. 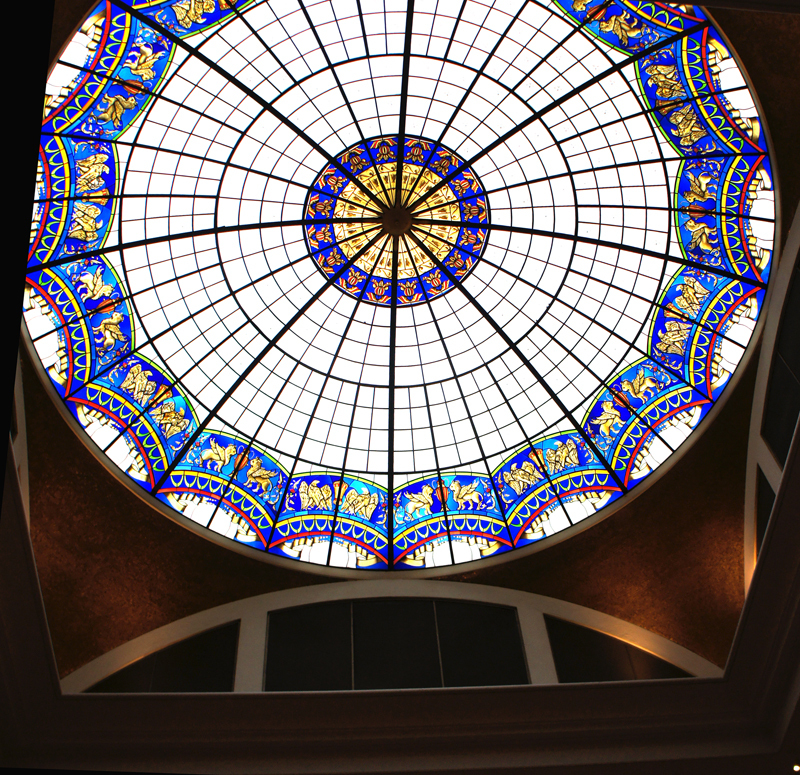 And with one final peek at the luminescent stained-glass dome high above, I shook off the ghost of Daisy Buchanan and I said goodbye to the Adlon Hotel. Imagine the scene, under communist rule, the phone lines of normal East Berlin citizens are tapped, and conversations recorded. The KGB officers in charge listen attentively, trained to discern any signs of ‘unorthodox political and religious ideas’; basically, any signs of free-thinking. 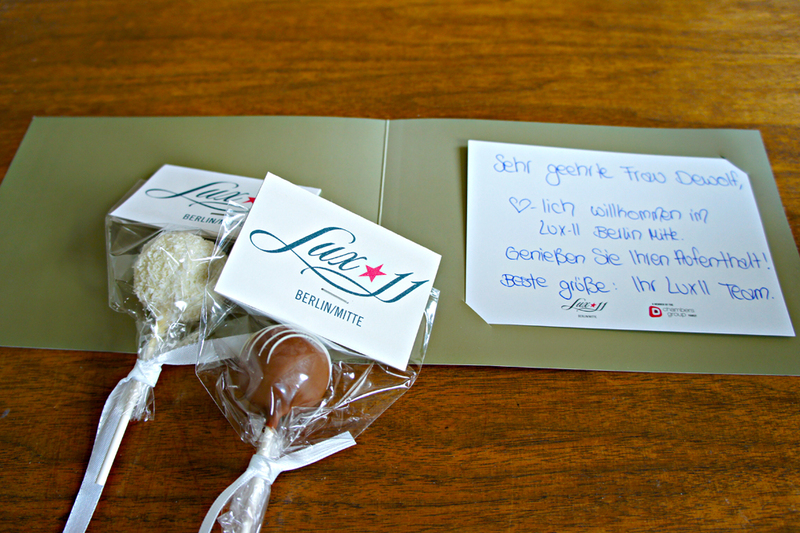 As I relax, cocooned in a luxurious room in one of Berlin’s hottest new boutique hotels, with its candy-cane bedthrow, and amply stocked minibar catering to my every whim, I find it hard to believe the Lux 11 Hotel was once the headquarters for such operations. 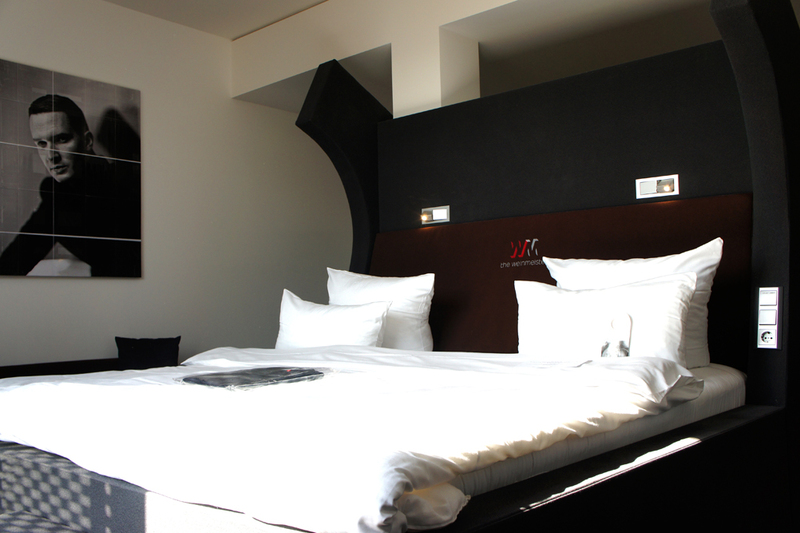 Located a mere 5 minutes from Alexanderplatz in the vibrant Mitte neighborhood, the hotel is perfectly poised for a night on the town; be it club hopping or bar crawling. 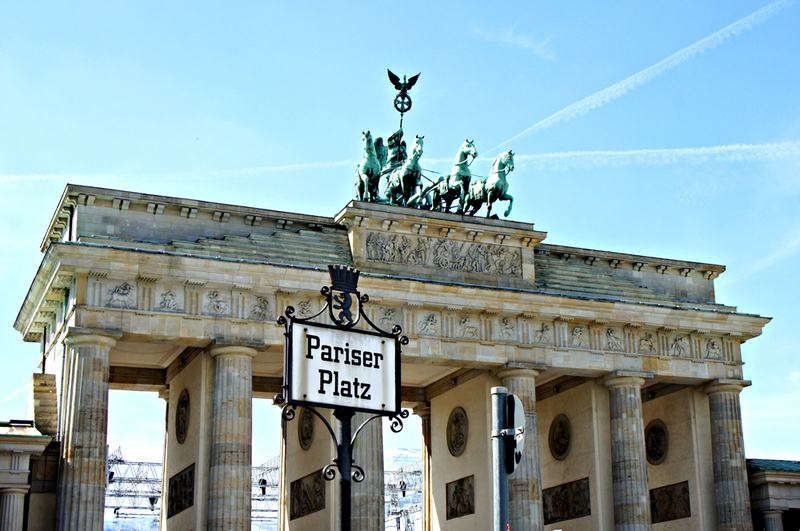 If that’s not your thing, then the location is also ideal for visiting the city’s museums and galleries, and there is no shortage of restaurant choices; whether you’re craving Berlin’s famous currywurst, authentic Italian pizzas or spicy Mexican burritos. 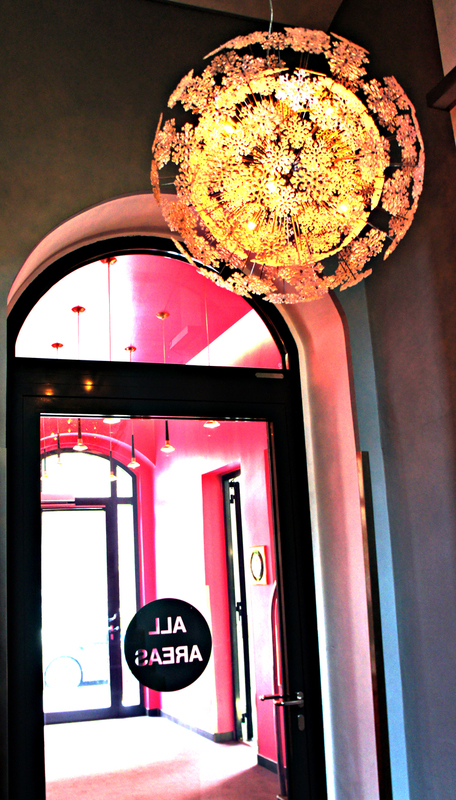 Lux 11 is a boutique hotel, housed in a sprawling whitewashed building. 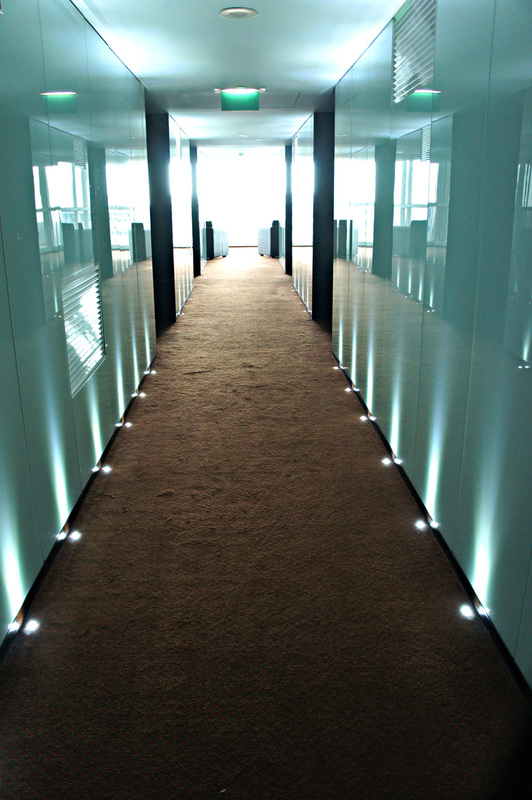 The alabaster backdrop is a designer’s dream, and as such, the minimalistic design elements of the hotel come to life. The furniture, in muted earthy tones allow for the deep contract of hot pink splashes that seem to jump out at you, aiming to surprise. I check in to an executive suite on the 3rd floor. 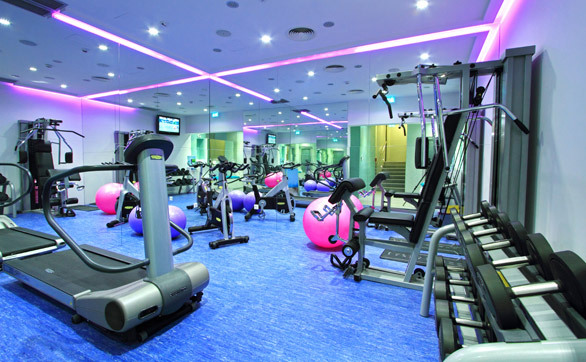 The room is huge – by any standard. Large windows run along one wall, letting in masses of daylight. 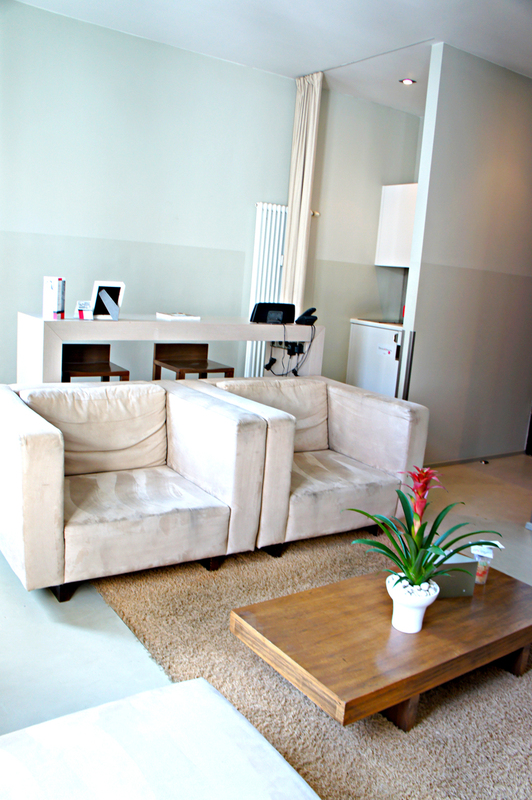 There is a living area, with beautiful monochrome couches and a contemporary low-lying coffee table. I find a long table on one end, which can be used for dining or working depending on your need. Sectioned off from the living area is the huge king sized bed in clean white linen, and the stylish bathroom with rain shower. The enormous walk in closet is any woman’s dream come true. It’s cozy, relaxed; with an ‘at-home’ feel that can be sorely missed after spending too many days on the road. 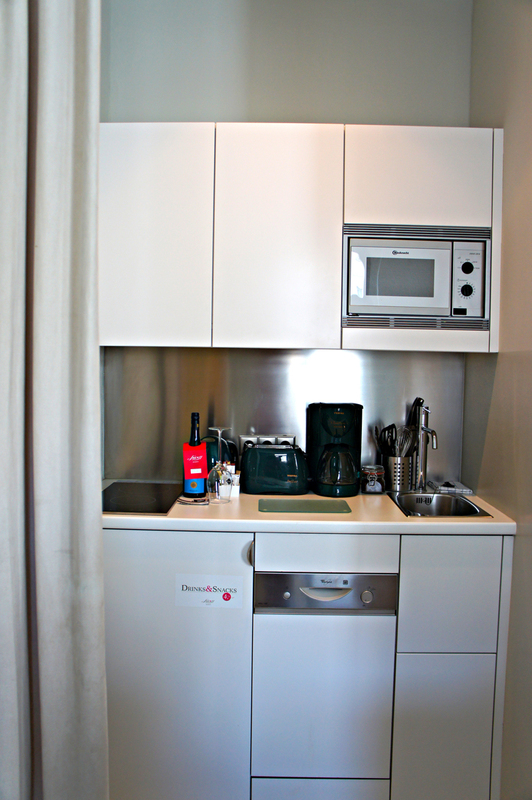 There is a fully functional kitchenette stocked with crockery and cutlery for 6 place settings and the bar fridge is well-appointed. 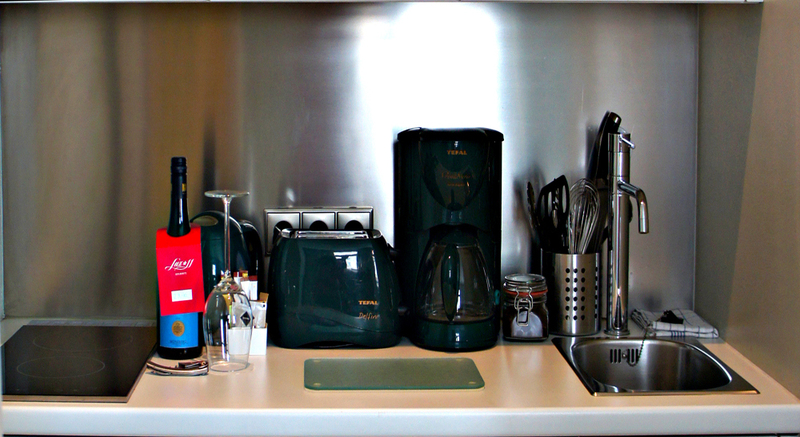 I find a toaster and a coffeemaker, which I use frequently. I think I love the aroma of freshly brewed coffee wafting through the room almost as much as the coffee itself. In the cupboard I find several long-stemmed wine glasses, and they seem to be issuing a siren call to the bottle of red sitting on the counter. To my amazement I find there is even a dishwasher! 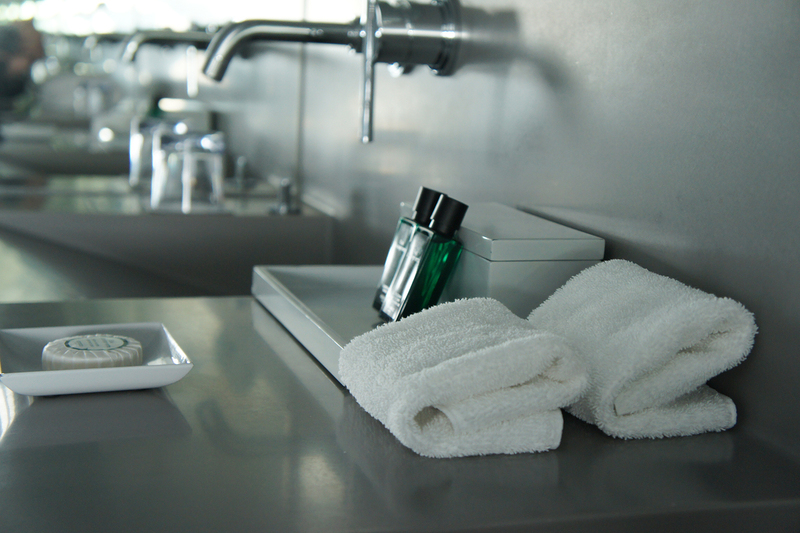 I love the luxurious full-size bath amenities and like its sister hotel, The Weinmeister, I find a range of essential toiletries in a gift box by the vanity –including minty dental floss. 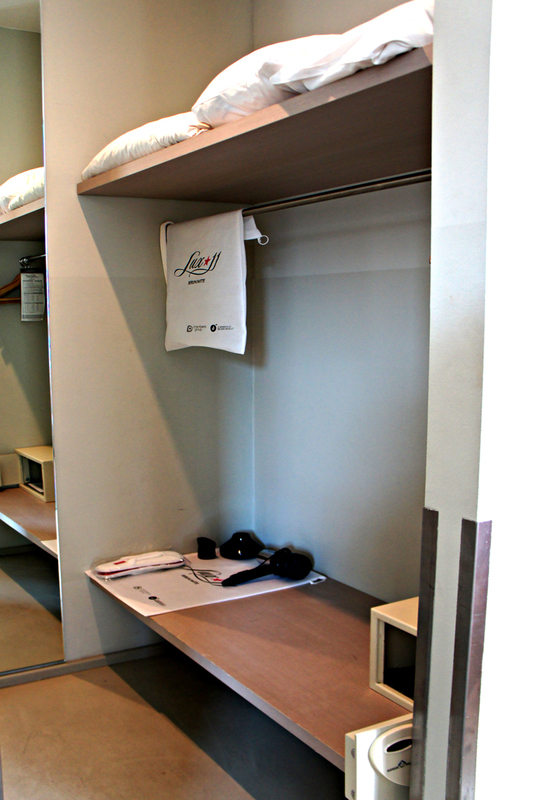 Lux 11 is exploring the concept of the ‘apart-hotel’, which provides all the comforts and luxury of a traditional hotel but with a coziness that allows guests to make the room their own – even if only for a short while. 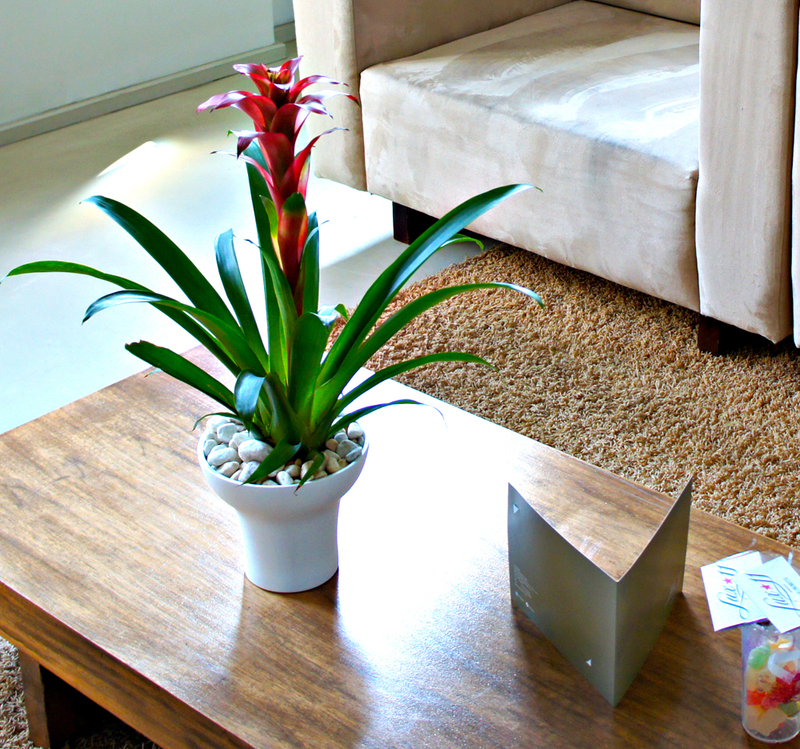 From the candy gifts to the iPod docking station, it seems no detail is too small at Lux 11. With its prime location and the contemporary minimalistic design, Lux 11 is the embodiment of Berlin itself: classic yet ever trendy; stately, but with a hint of a wild side. 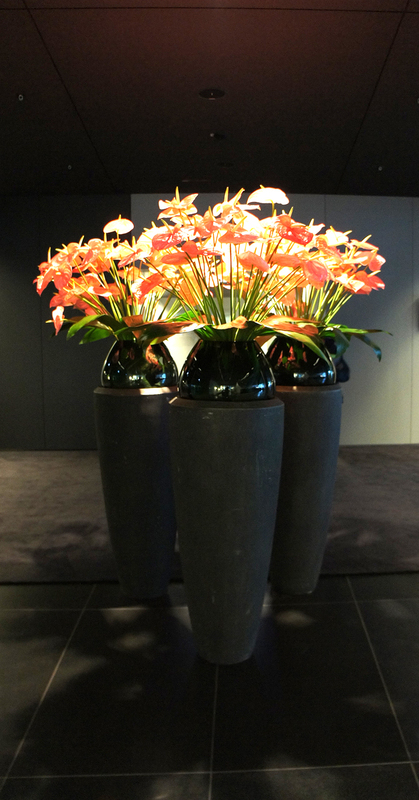 For the latest pricing and special offers visit the Lux 11 website. 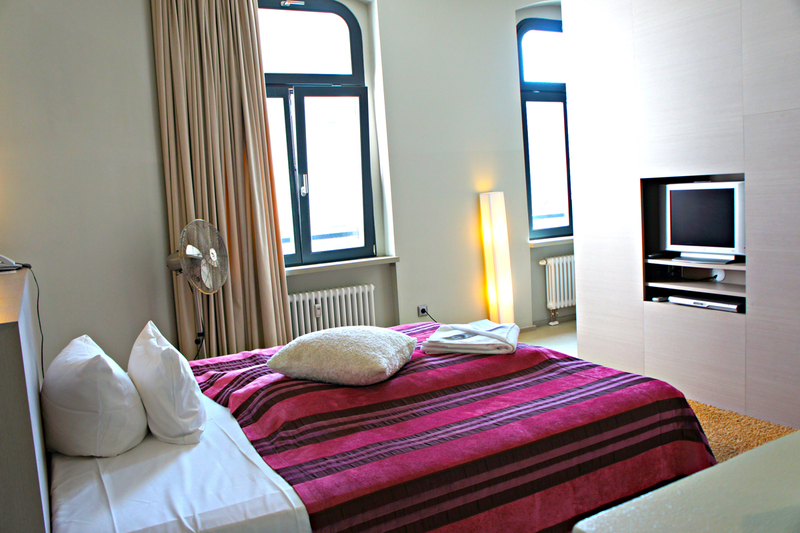 Rates from 119€ to 299€ per night (depending on various factors such as room category, season, events in Berlin and the number of people), excluding continental breakfast. 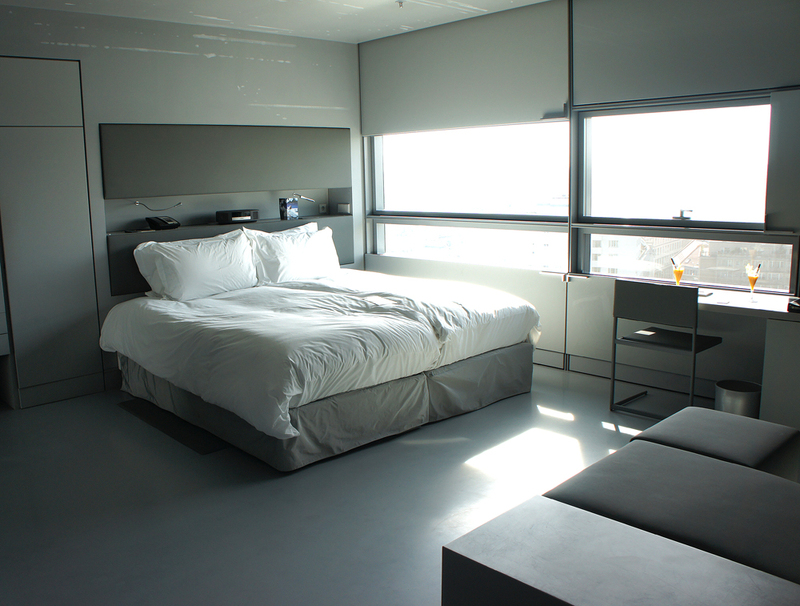 Disclaimer: I was a guest at the Lux 11 Design Hotel, staying in an Executive Suite. All opinions expressed in this review however, remain completely my own. ‘Hip’ and ‘happening’ are two words that can be used to describe Germany’s capital city. From the street food vibe to café culture, Berliners seem to be in-the-know on the latest trends, remaining ever so edgy, yet ever in style. In keeping, the Weinmeister Hotel located in one of Berlin’s coolest and most dynamic neighborhoods, Mitte, is a shining example of what transpires when design-luxury combines with all things ‘in vogue’. 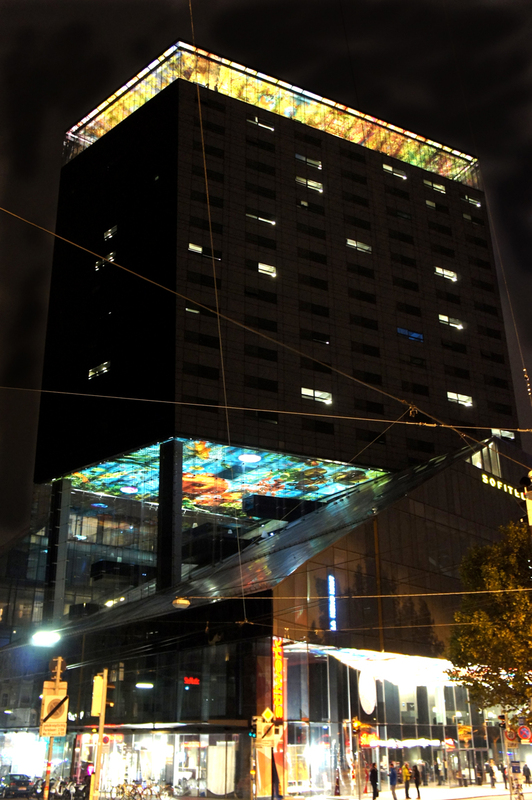 Referred to as the ‘Golden Cage’- in reference to the golden façade the six floor building exudes when lit up at night, it’s certainly a ‘cage’ you wouldn’t mind being stuck in. Arriving at the hotel one shouldn’t be fooled by the seemingly haphazard graffiti scrawled across the front entrance. 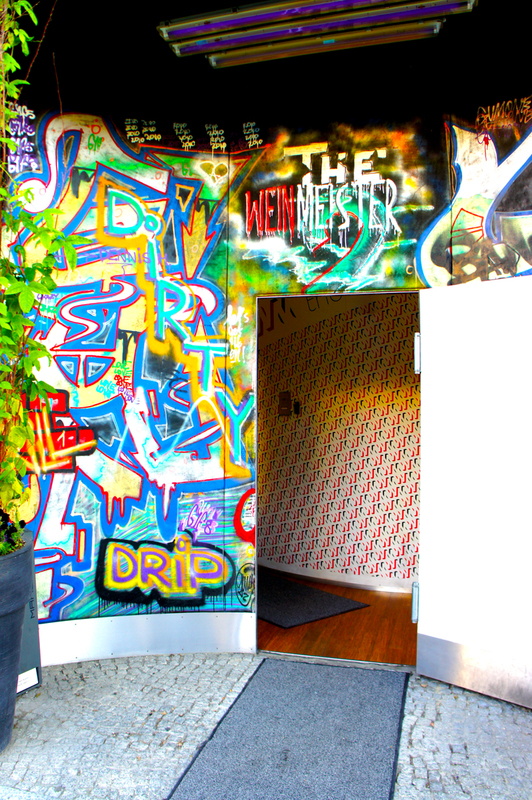 Graffiti is, after all, synonymous with Berlin, and the scribbling gives an opening taste of the provocative and daring design the Weinmeister hotel has perfected. Drawing a crowd of artistic clientele from the film, art and music industry, the hotel is known to be frequented by celebrities. 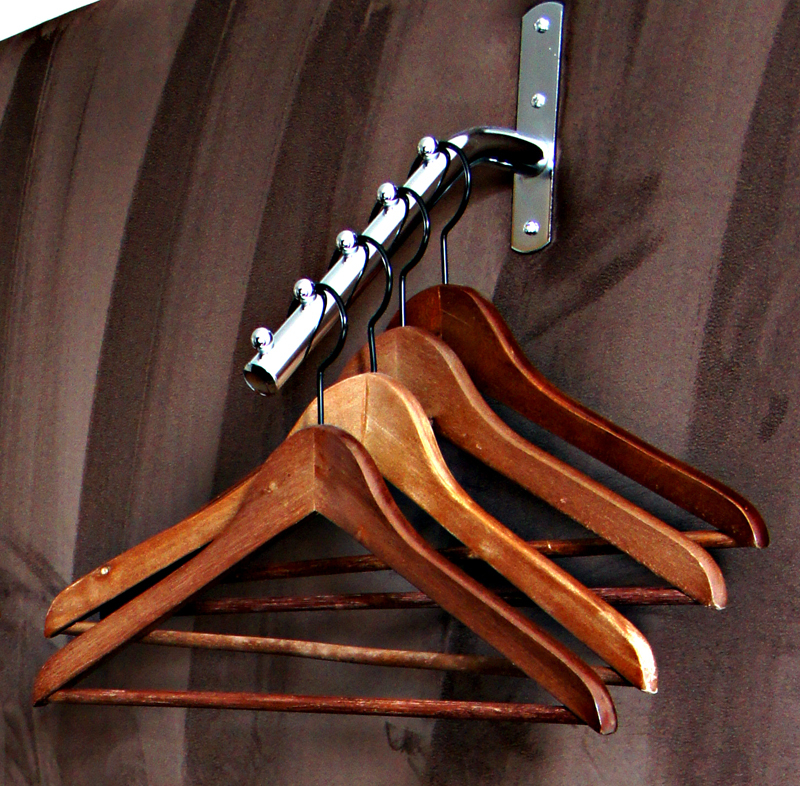 Paying homage to ‘monochrome’ with soft, earthy undertones the hotel oozes a luxurious modernity. 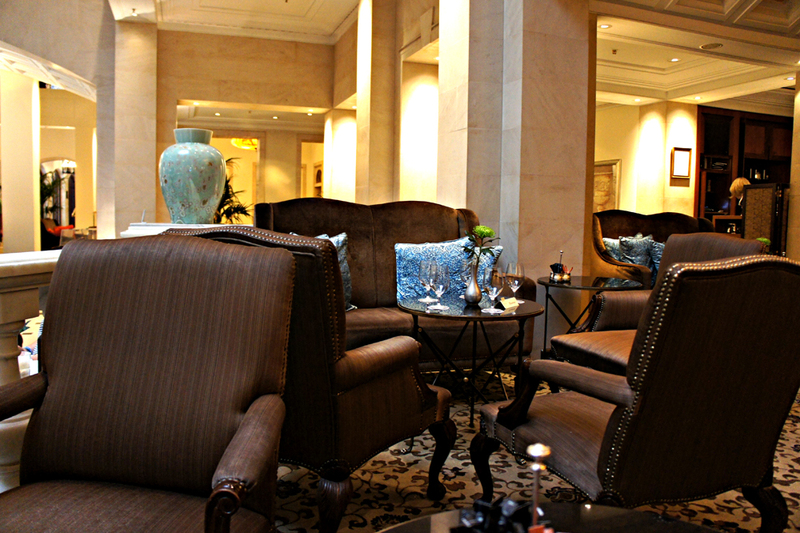 None more so, than in the Lobby Lounge; defined by oversized chairs in plush fabrics that invite you to sink in with a coffee and a book. 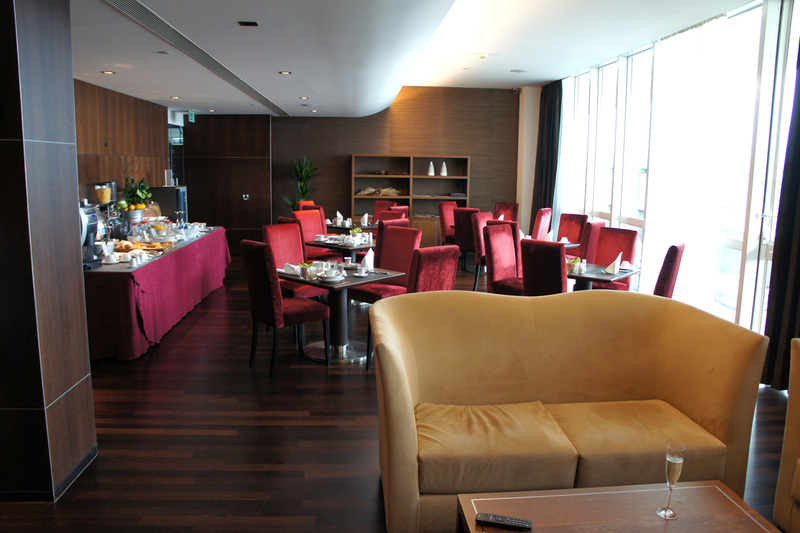 The space doubles as the hotel’s restaurant serving continental breakfasts and a selection of light dishes throughout the day. The Schwarz Bar is the draw card for the trendy population that breezes through the door of the Weinmeister Hotel on a seemingly endless loop. 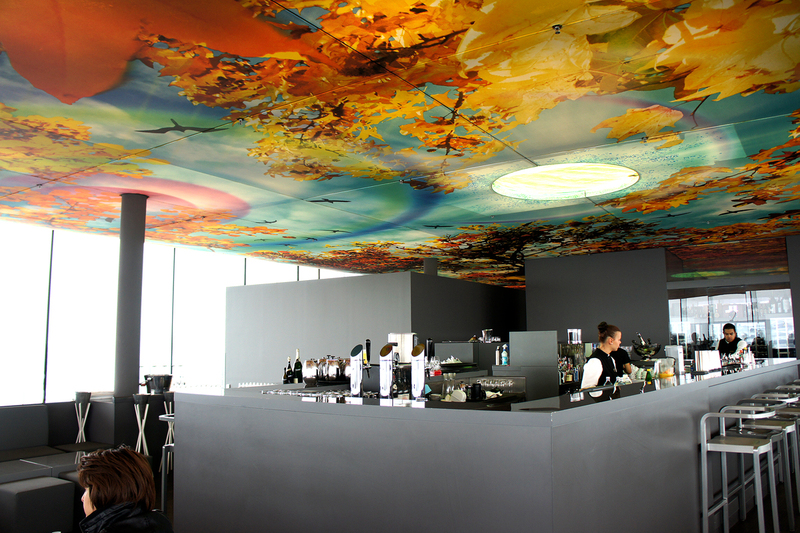 The bar is believed to be named after the German actress Jessica Schwarz, whose family brews a popular liqueur especially for the hotel. 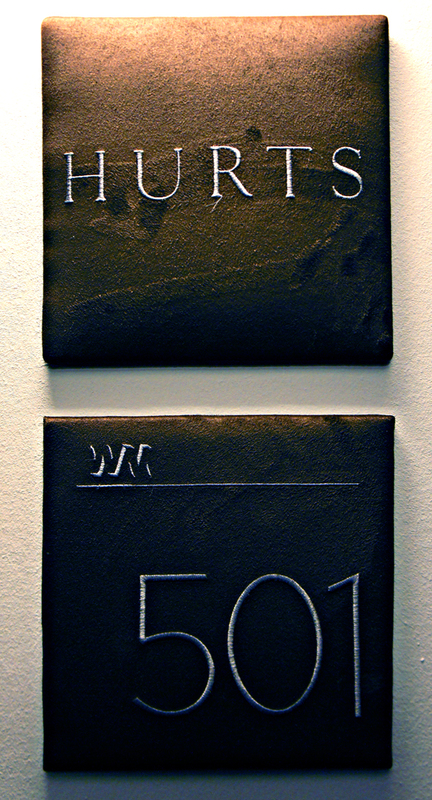 I check into room 501 – the Hurts Chamber; a rather special room at the Weinmeister Hotel. 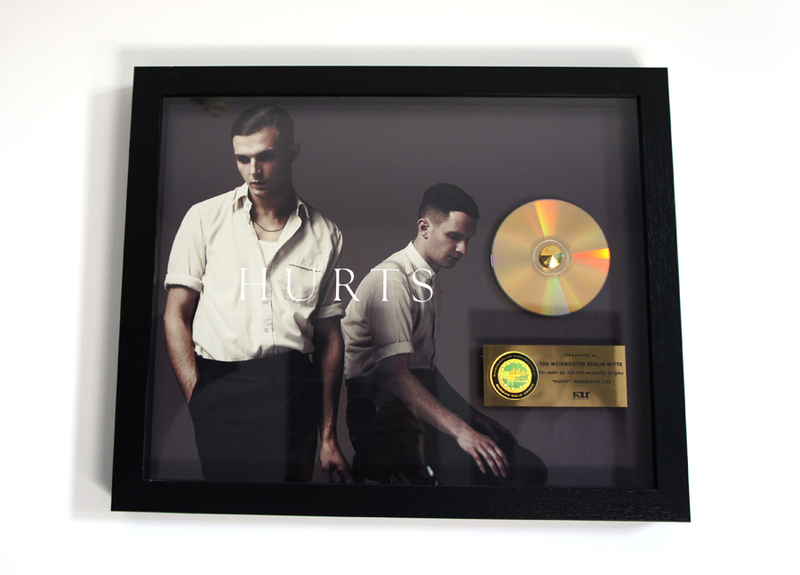 The room was designed by members of the British electro-pop duo, the Hurts, who have won a string of recognized music awards and have recently released their 2nd studio album. 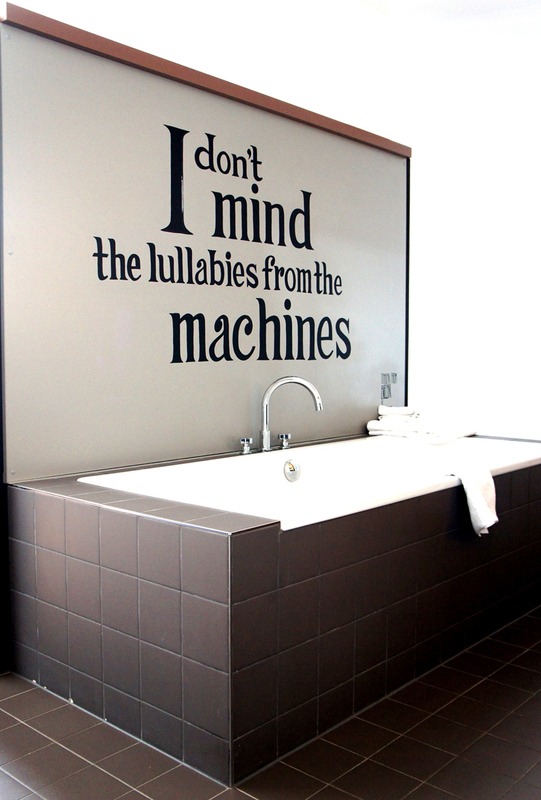 Alongside the generous bath in dark bold lettering: “I don’t mind the lullabies from the machines”; a quote from their song “Evelyn”. 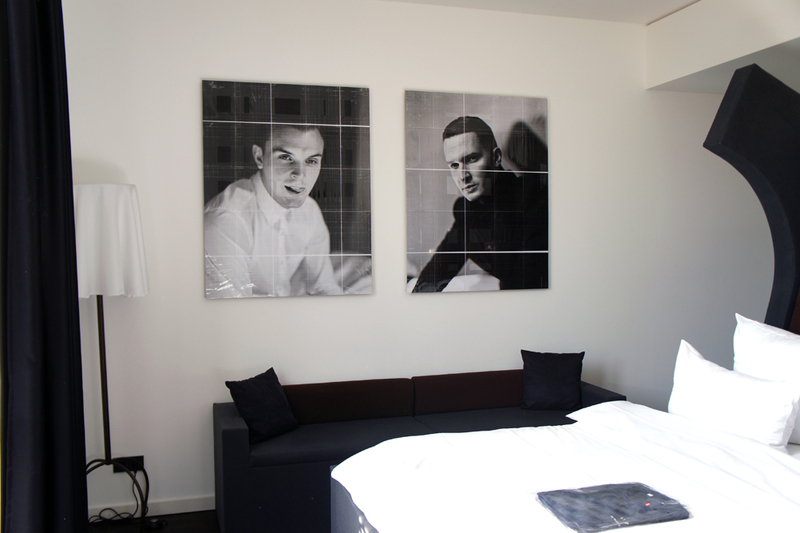 Giant black and white images of band’s members Theo Hutchcraft and Adam Anderson adorn the space, and their original gold record for the song ‘Wonderful Life’ hangs on the far wall – a gift to the hotel. 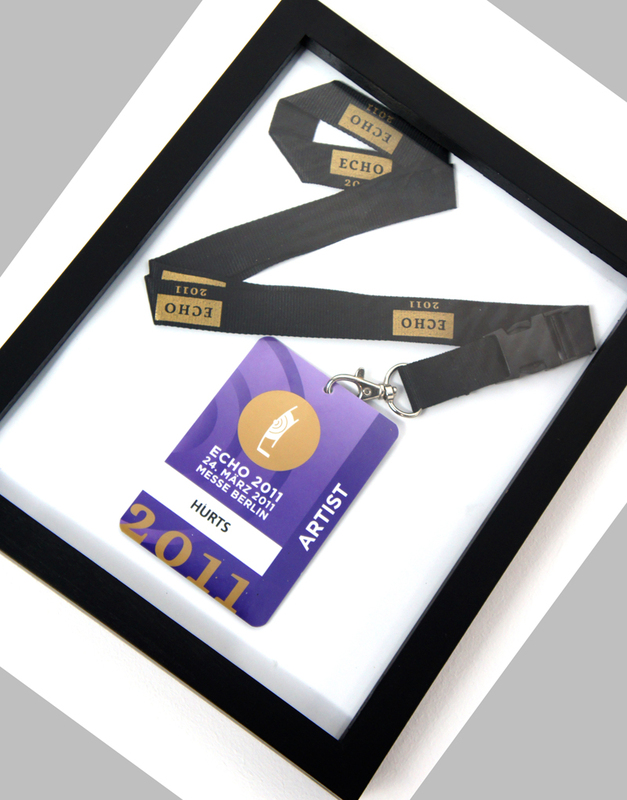 The influence of these two artists can be felt throughout the room: from the framed signed poster, to the concert backstage pass; from the books in the drawer to the music uploaded on the iMac computer. 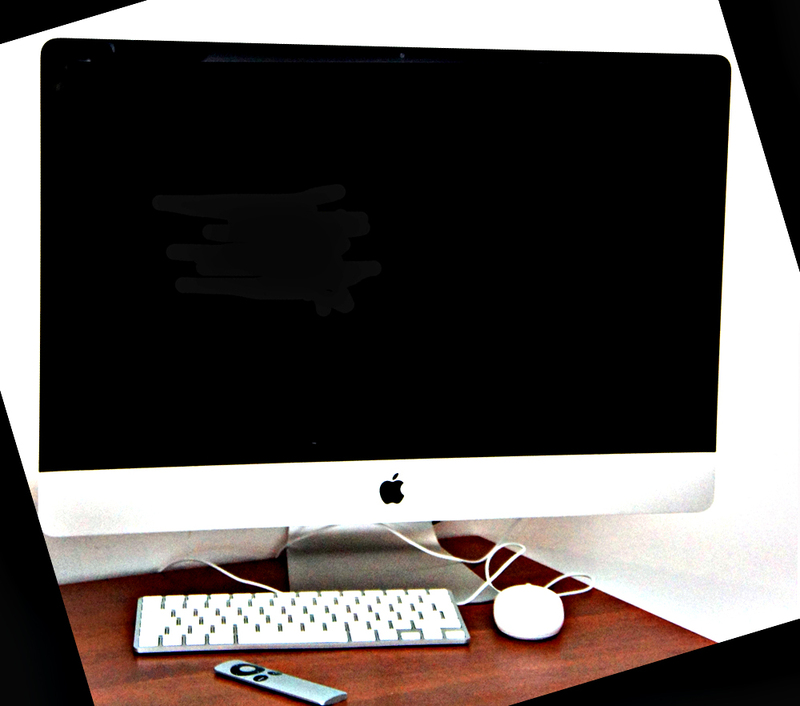 Did I mention there is an iMac computer?! Traditional television sets being obviously too lackluster for the Weinmeister hotel, all rooms are fully equipped with a large screen version of cutting-edge Apple technology. Internet access is quick and more importantly, free; whether you prefer using the computer or connecting to the Wifi on your own device. The room is huge. There is a couch lining one wall, a walk in shower, a work desk, and the aforementioned bathtub. There is no closet but rather, exposed clothes-hangers suspended above a storage chest that doubles as a bench. It’s certainly unorthodox, but that’s just the style of the Weinmeister. 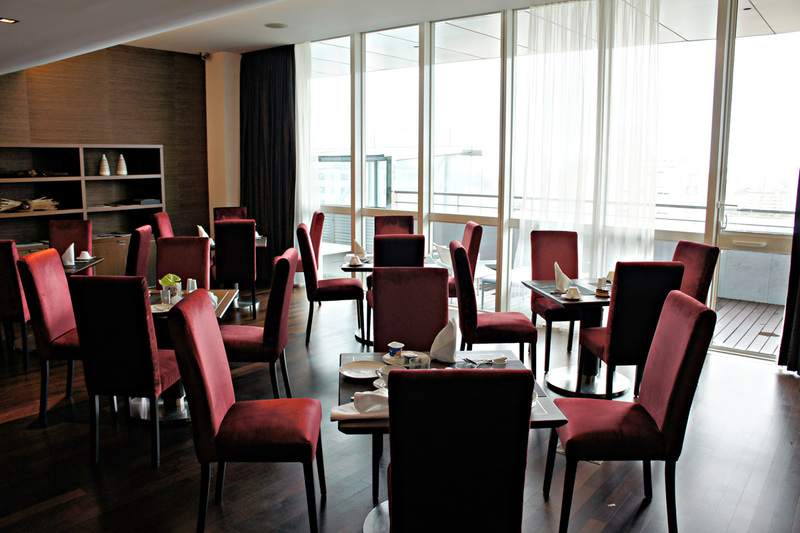 The room has a dynamic flow to it: the large floor-to-ceiling windows letting in an abundance of light. 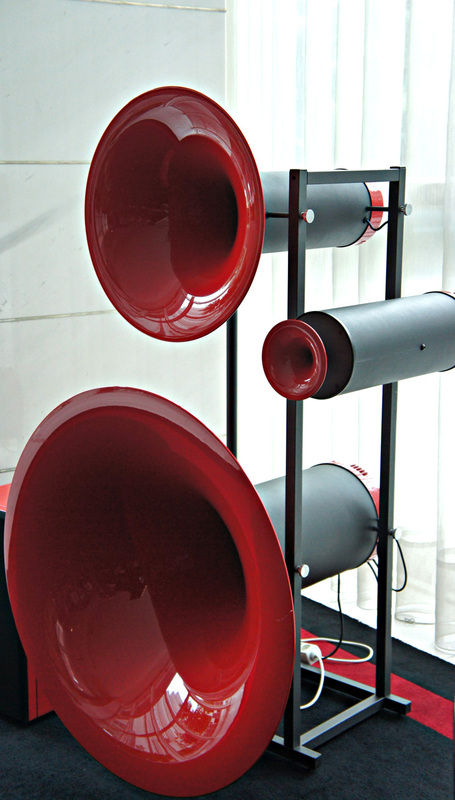 But it’s the bed – in its ‘pod’ design – that dominates the room. Oversized, and slightly imposing, it’s perfectly made up with crisp white linens. 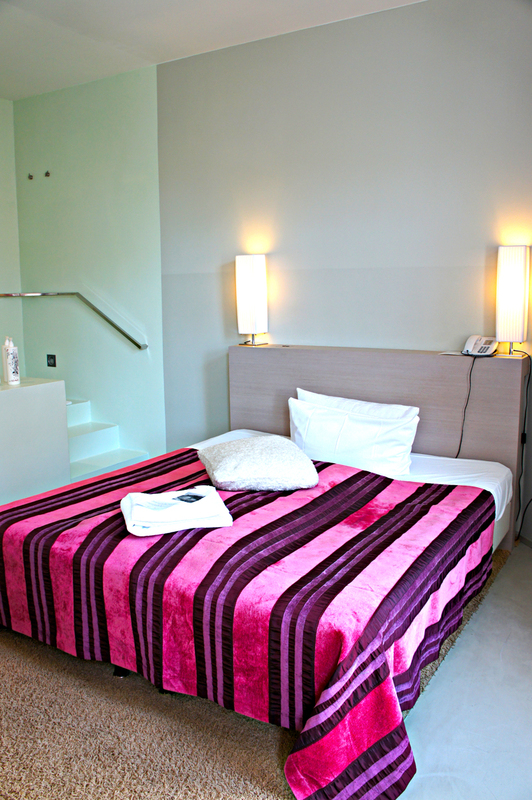 There is sufficient space between the pillows to fit another single bed – such is the enormity! 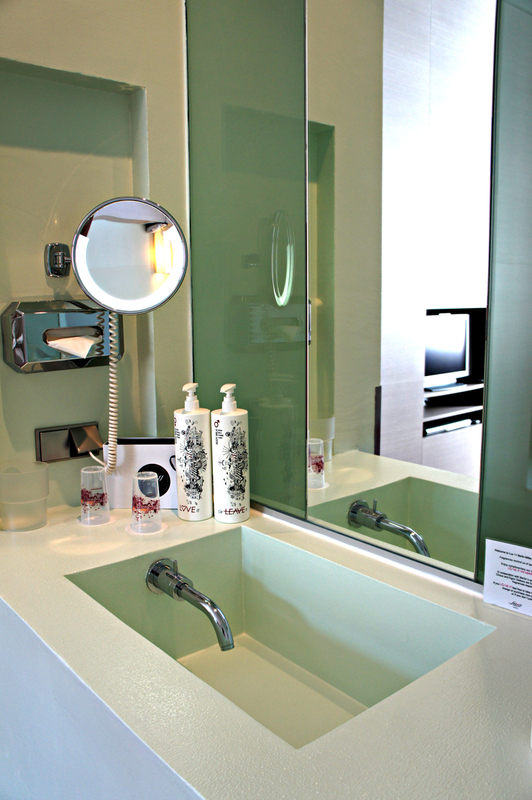 The vanity is stocked with outrageously decadent toiletries – full-sized bottles no less, so you’re not fumbling about with tiny lotions and shampoos like in typical hotels. There’s a collection for men with spicy masculine notes, and a female collection with softer, floral undertones created in collaboration with two leading perfumers. 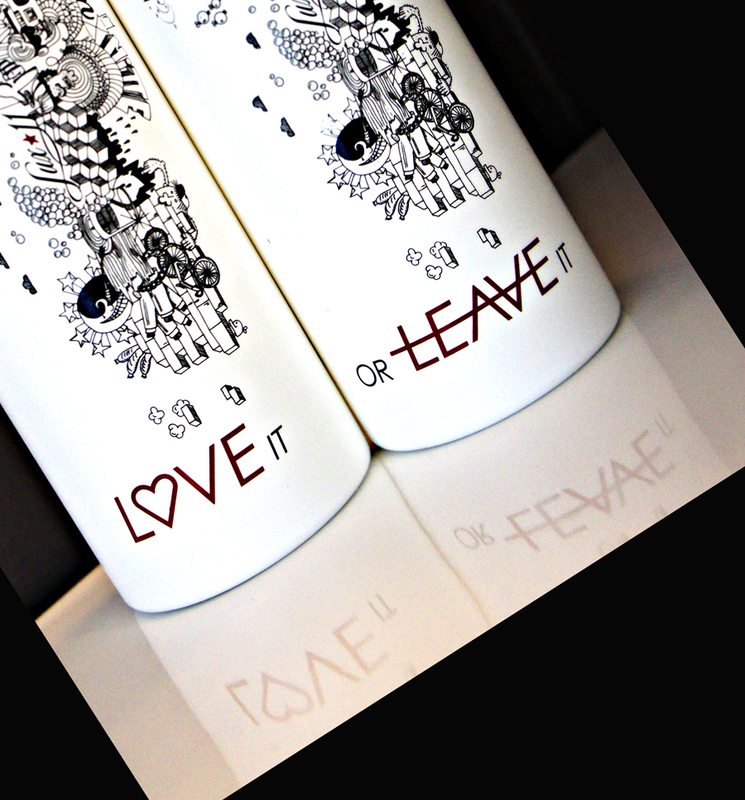 In keeping with the ethos of the hotel, the range is cheekily called “Love it or Leave it”. It seems the management has thought of everything, from the black cotton pyjamas that lay on the bed (in my right size! ), right down to the dental floss and hairband I find discreetly presented in the amenities box tied with a black satin ribbon. Even the slippers and bathrobe are nontraditional! 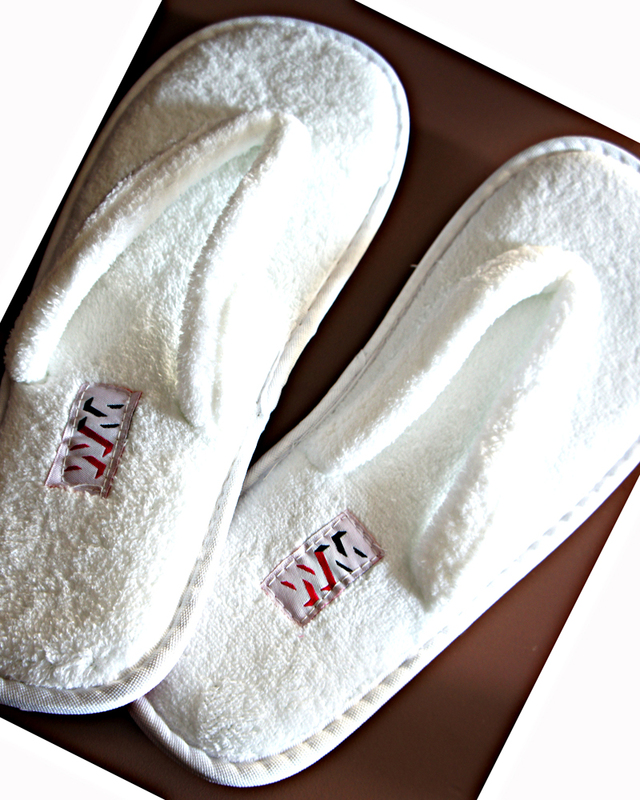 My feet are cushioned in fluffy flip-flops with hot pink soles, while the bathrobe is plush and soft. I run a bath and enjoy a decadent soak. I contemplate booking a session at the hotel’s spa on the 6th floor, but I make my way back down to the lobby for a little sightseeing instead. A little tip: when at all possible, take the stairs. 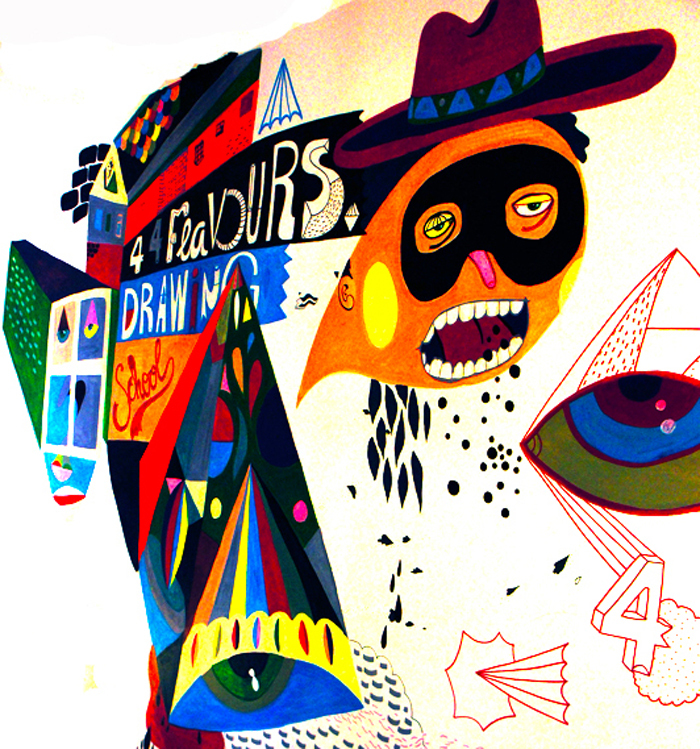 The walls and corridors of the stairwell come alive as an urban art gallery. Berlin based artists have gotten together to create the colorful cartoons and perplexing drawings that jump out at you, making you glad you skipped the elevator. I know that once I step outside the hotel I will find myself right in the center of the lively Mitte district; an array of restaurants, bars and cafes at my fancy. Finally, squinting into the elusive German sunlight, I reluctantly ‘escape’ the cage – granting, only for a short while – as I begin my exploration of this fascinating city. 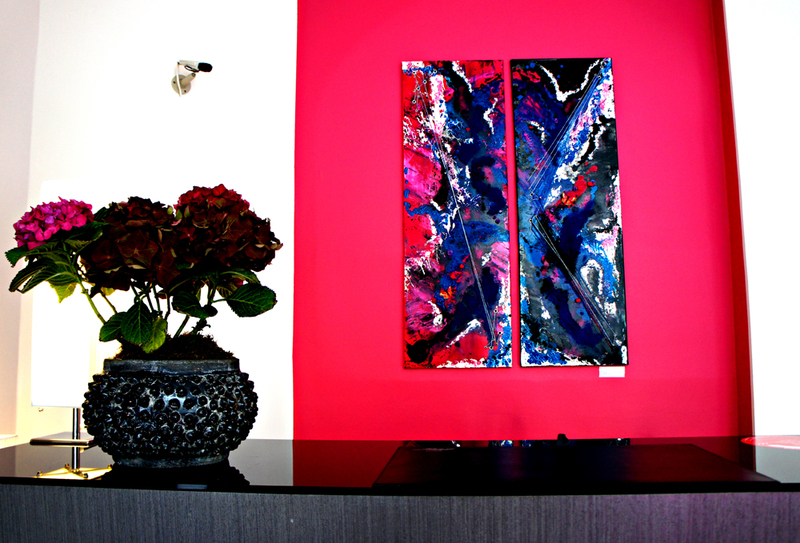 The stylish feel of the hotel: The edgy designs, the color choices and the flamboyant, oversized furniture choices create a space that doesn’t sacrifice function to form. 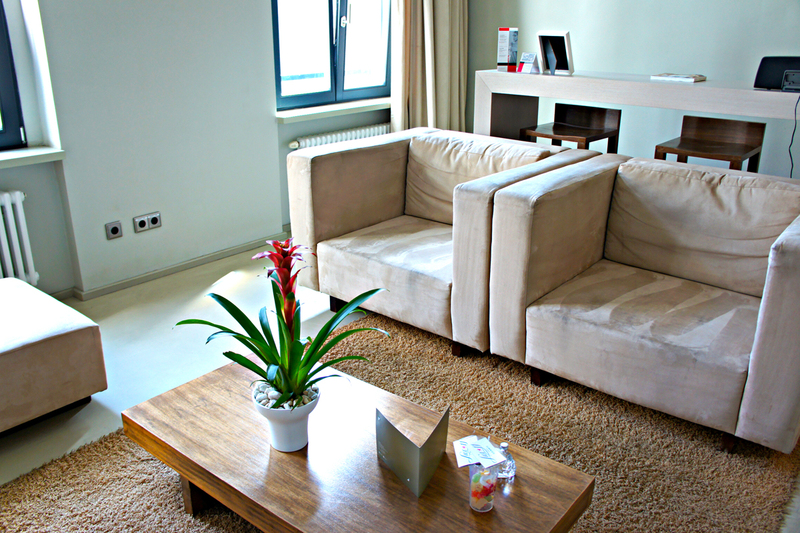 I truly loved the modern feel of the rooms and common areas. 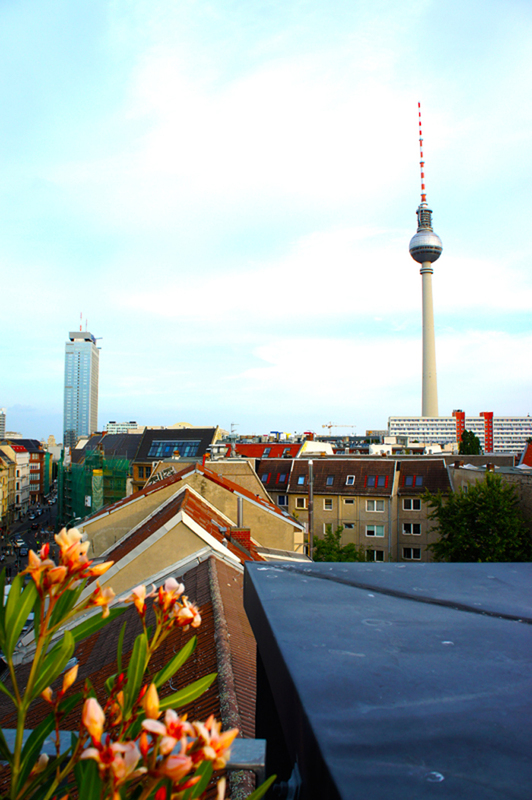 The rooftop terrace: with amazing views over Berlin, it’s the perfect spot to enjoy a sundowner. Location: There is not much more than can be said about the location of the Weinmeister hotel, except that it is the perfect base to explore the city. Concept Rooms: From the Hurts Chamber, to the Peppermint Jam room, there are some special concept rooms available at the hotel that is sure to add a little something extra to your stay. • The one small gripe I have would be that the hotel serves only continental breakfast. If you’re looking to start your day off with a full, hot breakfast you’d have to find a restaurant in the nearby area. However, it’s worth noting that there is the opportunity to make your own waffles and boil your own eggs…if you’re seriously craving some hot breakfast options. 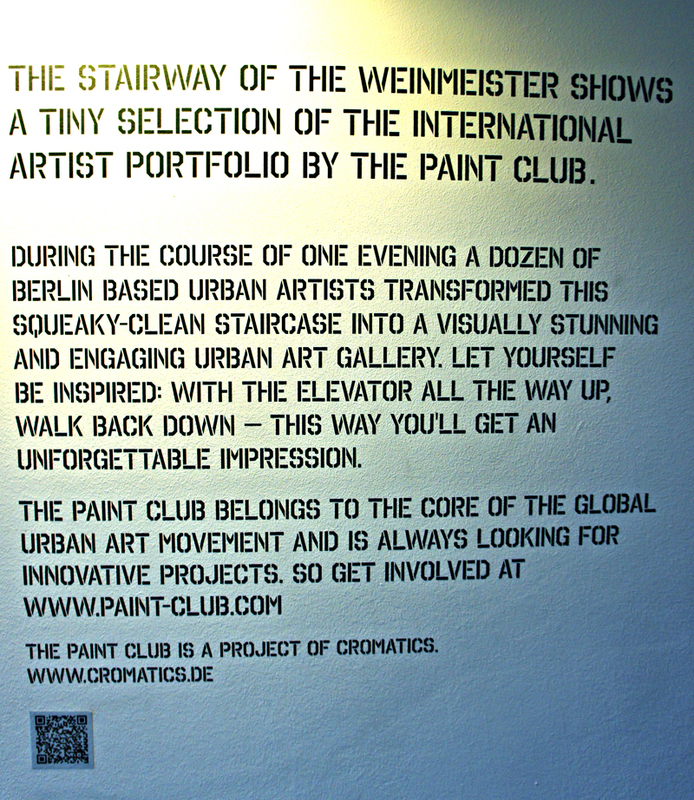 All in all, I thoroughly enjoyed my stay at the The Weinmeister Hotel, which provided a fresh dose of contemporary luxury in the heart of Berlin. For the latest pricing and special offers visit the Weinmeister’s official site. In keeping with the über-cool nature of the Weinmeister, room categories are standard, medium and large, with rates from 119€ to 299€ per night (depending on various factors such as room category, season, events in Berlin and the number of people), excluding continental breakfast. Disclaimer: I was a guest at the Weinmeister Hotel, staying in the Hurts Chamber   (large room category) including continental breakfast. All opinions expressed in this review however, remain completely my own. Walking along the Avenue Georges V is an experience in itself. Having just passed the colossal Louis Vuitton flagship store, with its ornate gold dinosaur window displays, we rounded the corner and strolled along the relatively tranquil street in wonder. The Avenue Georges V, together with the Champs Élysée and Avenue Montaigne, form what it called the ‘Triangle D’Or’ – the Golden Triangle. Apt, seeing as the net worth on these 3 streets alone probably rival the GDP of some small countries. 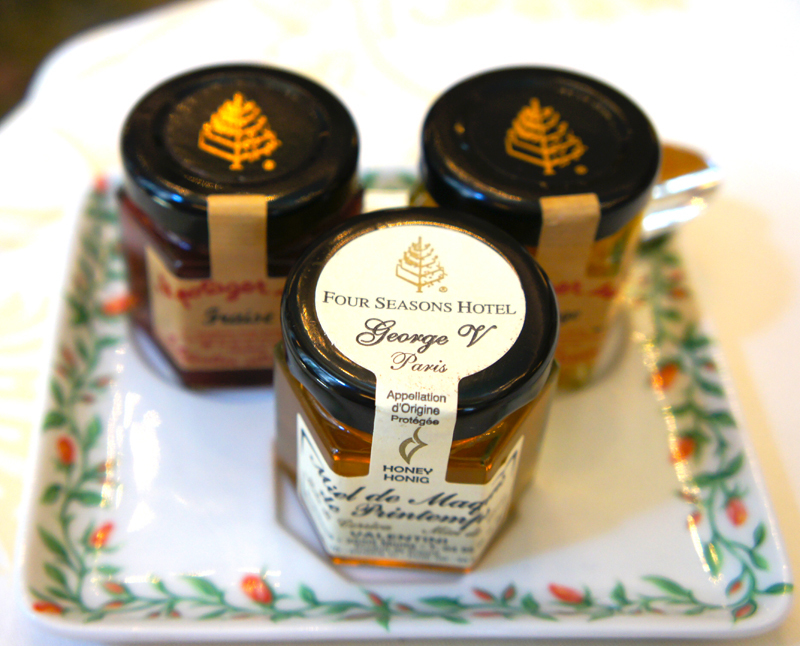 We knew we had arrived at the Four Season’s Hotel Georges V, when our feet sank into a super plush carpet on the street entrance – a telling sign of the luxury that was about to come. 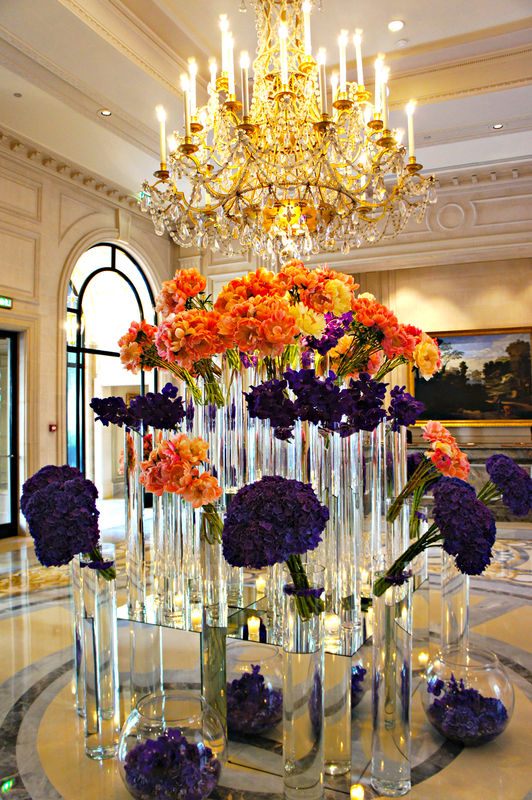 Owned by a Saudi Prince, no extravagance was spared in the hotel’s renovations in 1997, and the hotel proudly claims a spot amongst the six establishments in Paris to have been awarded the honor of ‘Palace’ classification. 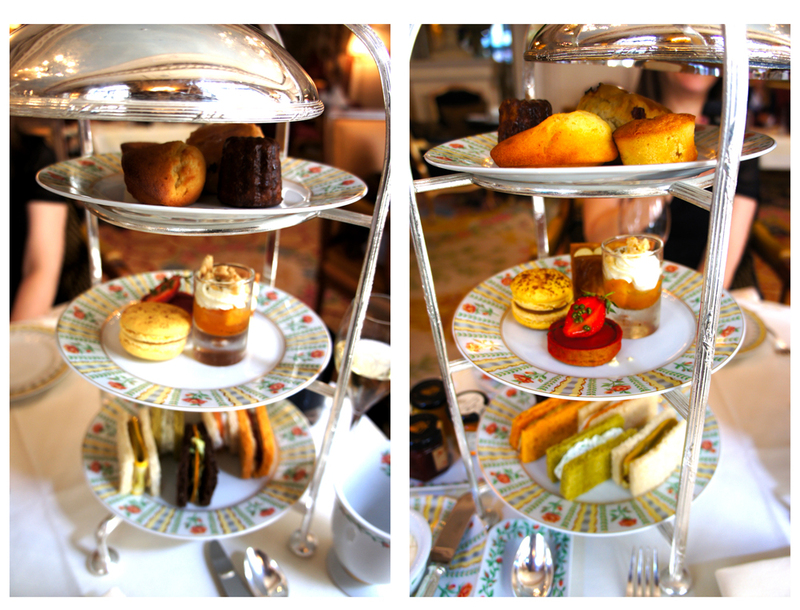 Having recently become accustomed to the decadent tradition of Afternoon High Tea, my friend Sam and I took the opportunity to investigate the High Tea offerings at this renowned Parisian Hotel. Upon entering through the ornate revolving door, my breath was instantly taken away! 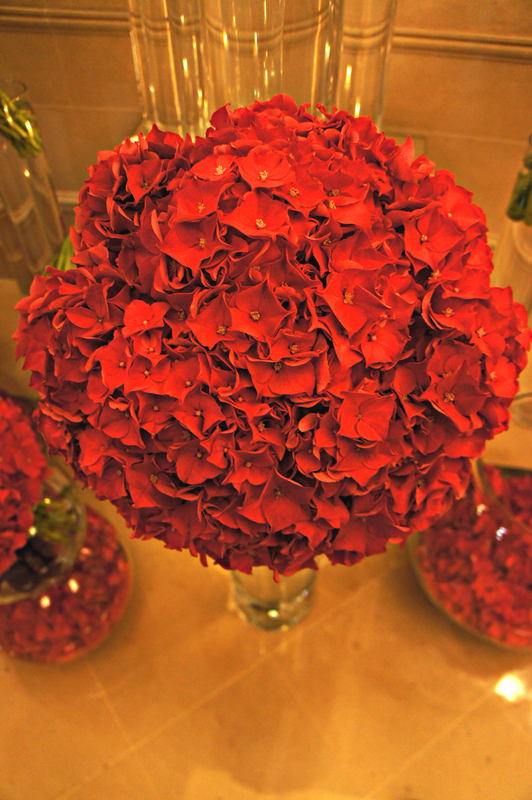 In front of me stood the most theatrical, the most extravagant – by far – flower display I had ever seen. 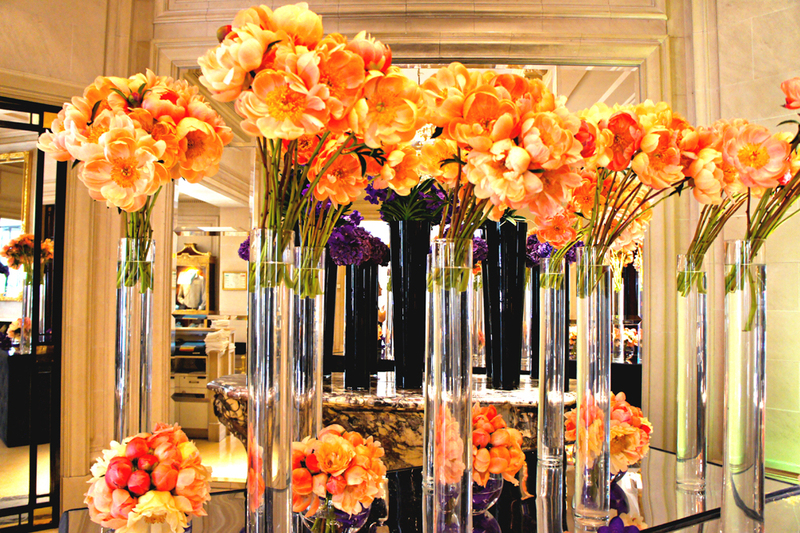 Don’t get me wrong, I was well aware that the hotel’s florist extraordinaire; Jeff Leatham has a long standing reputation at the Georges V, but nothing prepared me for the sight which greeted us in the hotel’s lobby. Coral-tinged peonies (hundreds and hundreds of them) elegantly collided with deep purple hydrangeas to create a summer wonderland. Indeed, feeling like two Alices who had just sashayed down the rabbit hole, Sam and I crossed the foyer and into the Mad Hatter’s dreamland. To the left there was a giant installation (not arrangement, as Mr. Leatham likes to call it) of red posies – again a dazzling marriage of peonies and hydrangeas. 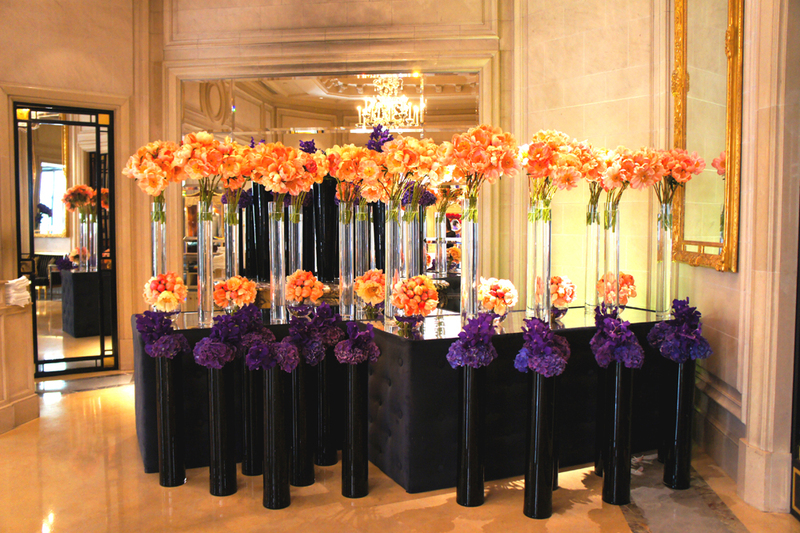 En masse, and shaped into several perfectly round, individual bouquets, they took their daring places in tall flute vases of varying height to create what can only be described as a Jeff Leatham work of art. In fact, so esteemed are the rock-star of florist’s creations, that his celebrity clientele include the likes of Oprah Winfrey, Madonna, Celine Dion and Kylie Minogue. When he’s not creating floral installations for His Holiness the Dalai Lama, or putting together daring designs for celebrity weddings (he was commissioned for Eva Longoria’s wedding to Tony Parker), he serves as the in-resident flower guru for the Hotel Georges V.
We stepped out into the grand central courtyard of the hotel, and again uttered astonished ‘oohs’ and ‘ahhs’ at the overhead floral designs. 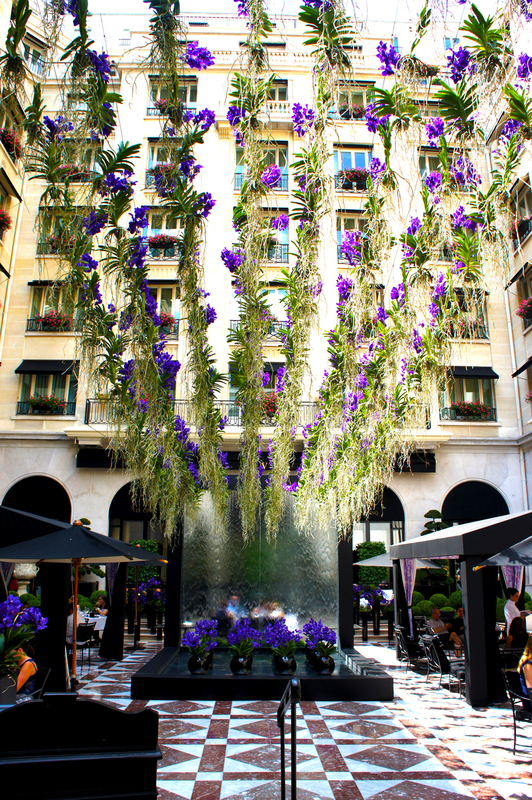 Strings of purple Vanda orchids were suspended in the air, fashioning a stunning canopy over the courtyard as rays of sunshine streamed in, creating an ethereal atmosphere. 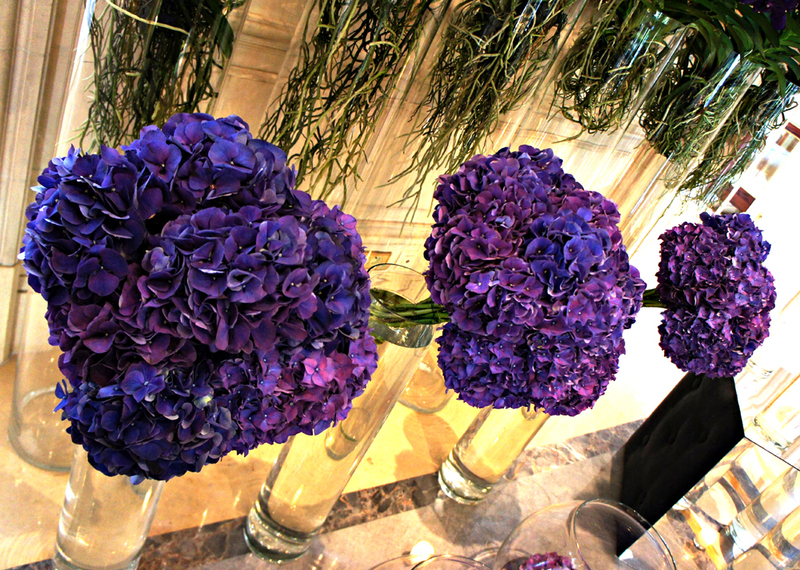 Making our way pass yet more impressive floral designs we headed to La Galerie where afternoon tea was served. 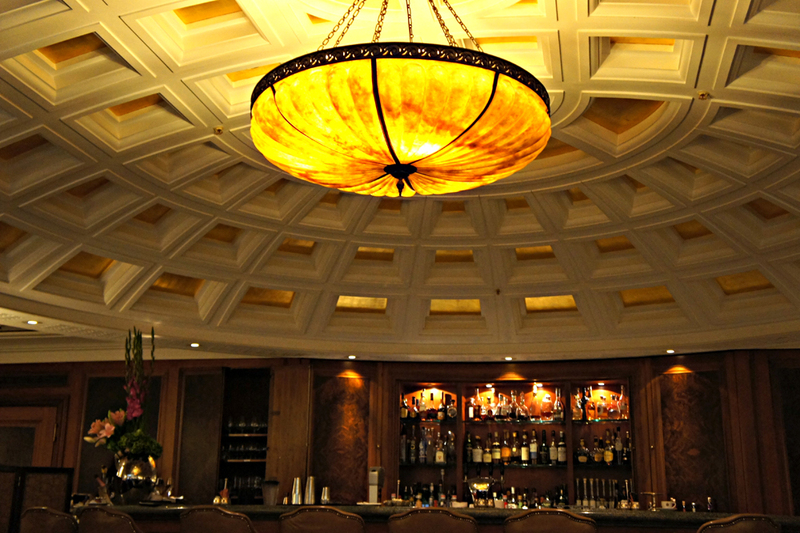 La Galerie’s décor can only be described as opulent. 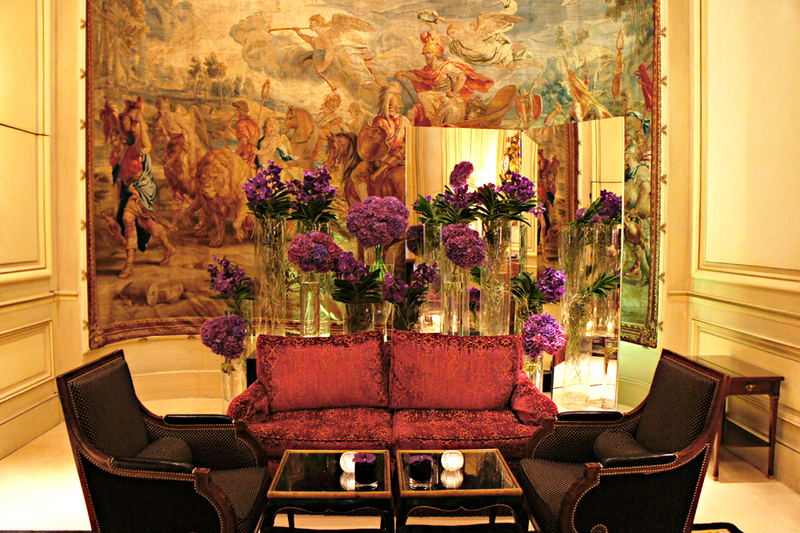 Priceless historical antiques adorned the space, along with fine Flemish tapestries dating back to the 17th century. Murano-glass chandeliers hung aristocratically from the high ceilings, and a 500 square-foot Savonnerie carpet graced the floors. No Dorothy, we were certainly not in Kansas anymore. We were shown to our table which was set with fine Limoges porcelain. Before we even sat down, the maître d’ brought over two little stools for which to lay our handbags -no handbags on the floor at the Georges V! 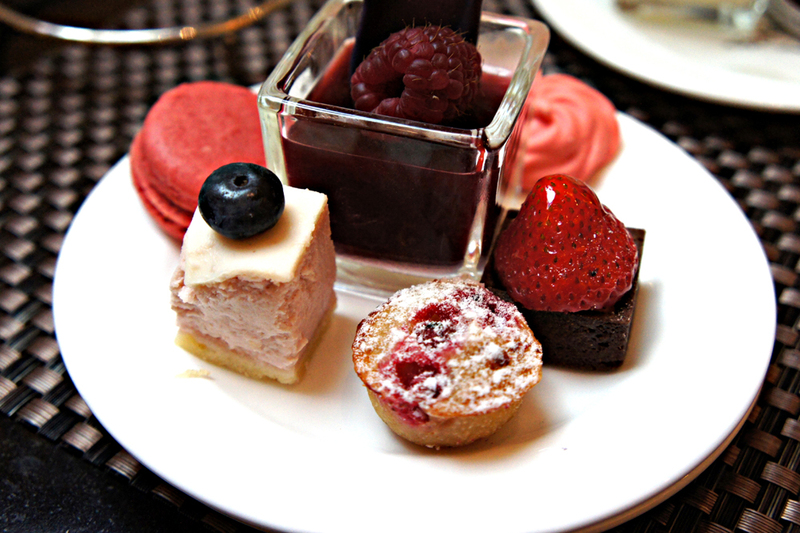 We browsed the menu and settled on “Thé complet a la Française”: The French twist on an elegant British tradition. 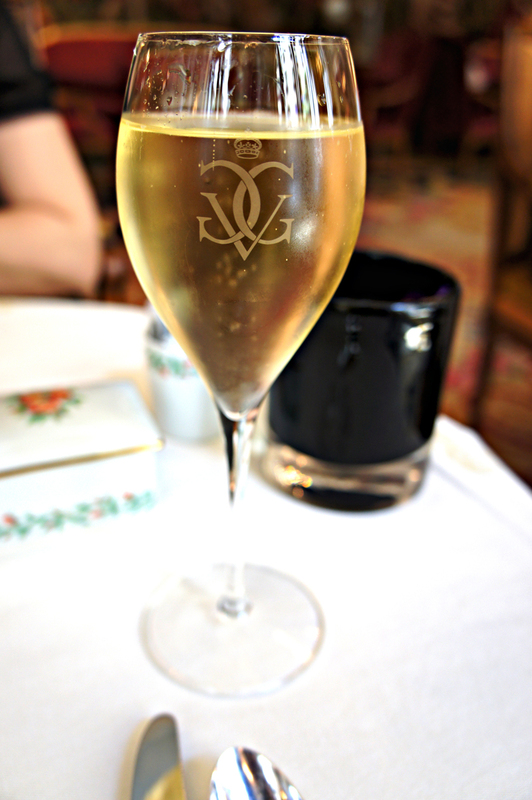 Our waiter took our order, and promptly arrived with 2 champagne glasses (monogrammed, no less!) that were ceremoniously filled with Moet & Chandon bubbly. We toasted to our auspicious surroundings as we sipped on the liquid gold. 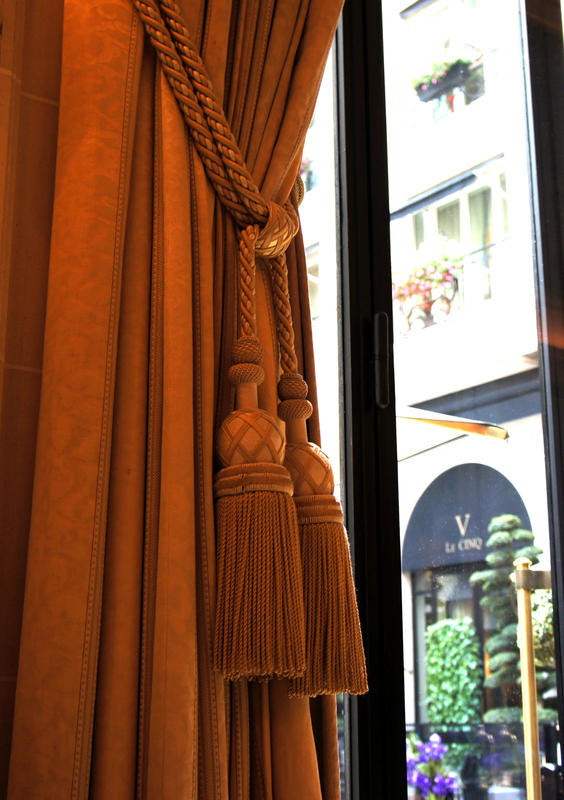 Taking in the atmosphere of La Galerie, I noted it is the most perfect spot in the hotel to people-watch. From the families outside in the courtyard enjoying lunch, to the well-heeled couples appreciating a sundowner before sundown; I kept one eye on the entrance half expecting a celebrity sighting (not uncommon at the Georges V). Our waiter magically appeared with our three-tiered trays laden with epicurean treats. On the first tier; an assortment of finger sandwiches prepared with an array of different breads (tomato, rye and spinach). The sandwiches can be ordered to your preference, as I chose a vegetarian option. 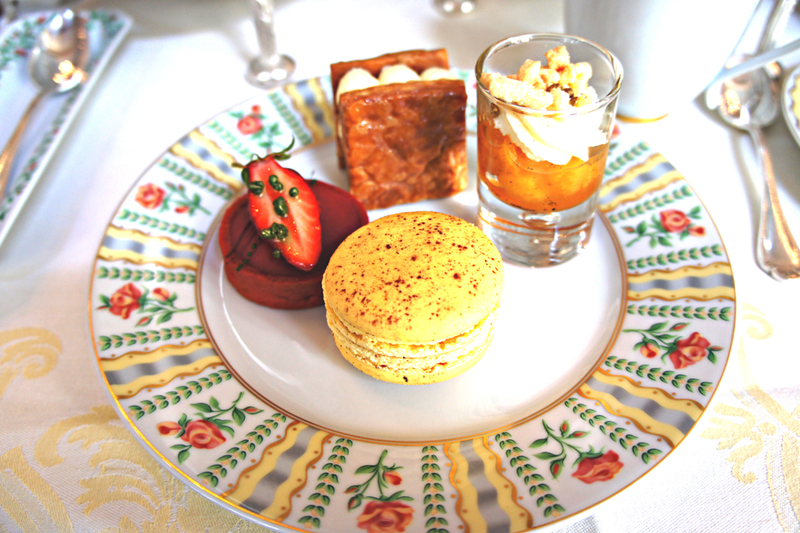 The second tier comprised of an assortment of French delicacies that included a creamy, cinnamon-dusted macaroon, mille-feuille (‘thousand sheets’ – referring to the layered pastry) with piped custard, a strawberry tartlet, and apricot panna cotta topped with roasted almonds. The macaroon was by far the best I had ever tasted – Ladureé be warned! 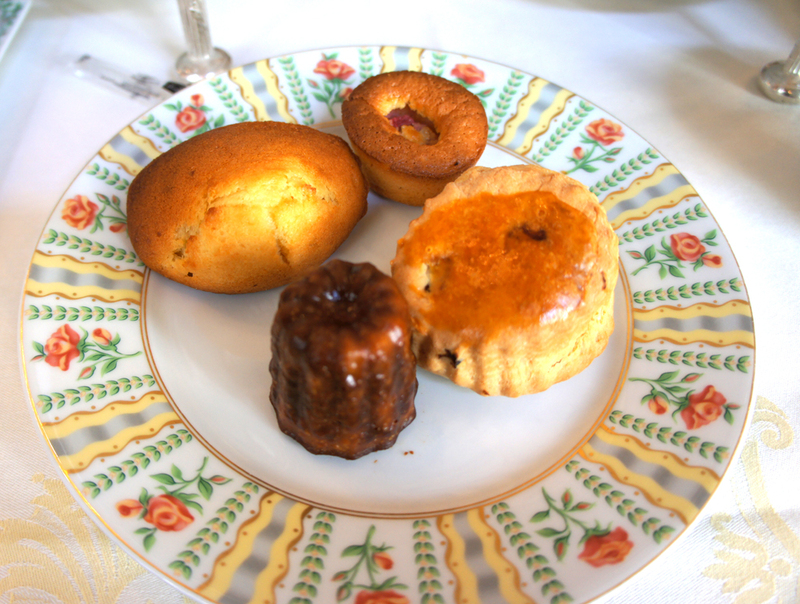 As if that wasn’t enough, the top tier, and perhaps my favorite, comprised of a warm scone, a madeleine (soft French cake immortalized by Marcel Proust’s memories), a caramelized canelé from Bordeaux and a petite raspberry financier. 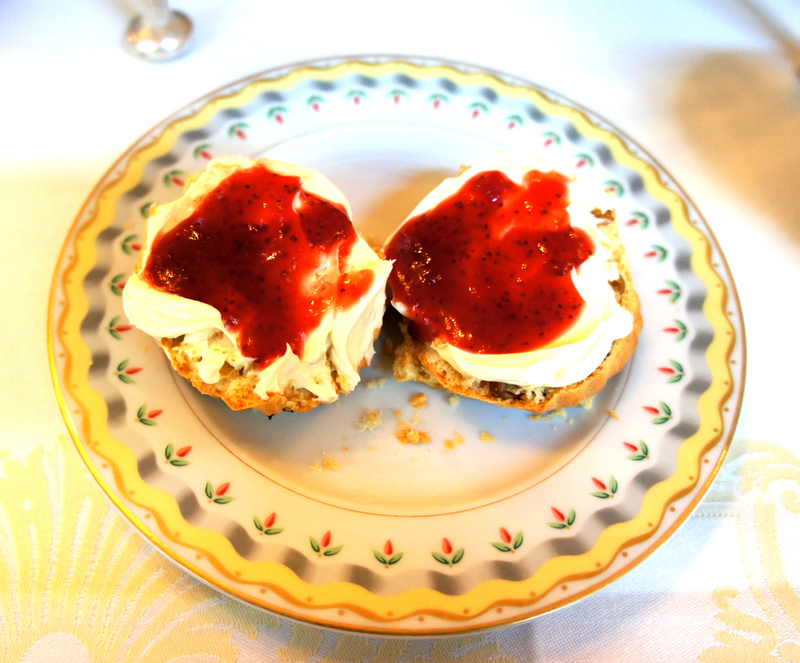 I covered my scone in clotted cream and generously smothered strawberry jam, while Sam simply drenched hers in honey. Our tastebuds went to heaven! For our hot beverages, my companion chose a white tea from the extensive selection, while I was eager to sample the hotel’s famous hot chocolate. Served in an authentic hot chocolate pot (‘chocolatière’) complete with frother, the hot chocolate is unbelievably decadent, thick and creamy. It is served with warm milk in the event you needed to dilute the chocolaty goodness. 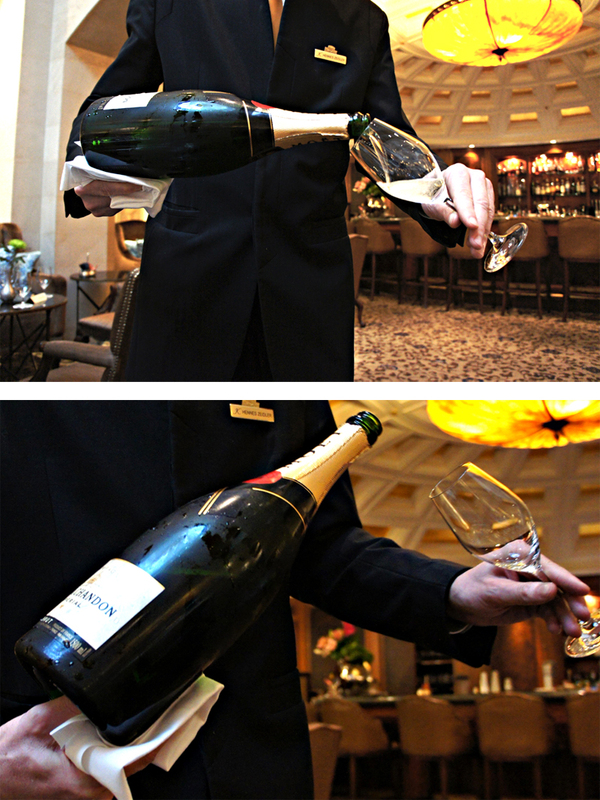 The beverages are poured for you (bien sûr! ), and the waiter flitted by every now and then to see if we were in the mood for a refill. 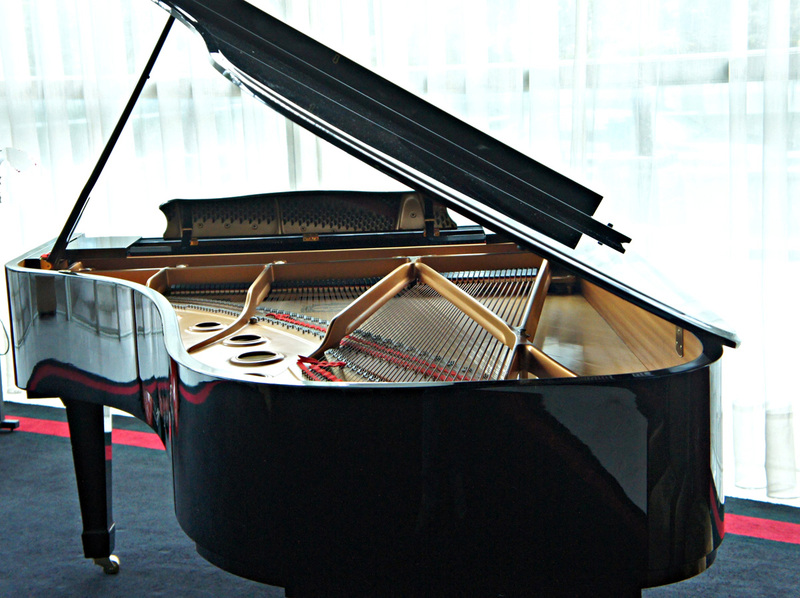 A pair of musicians serenaded the guests, and we sat relaxed – chatting, laughing, and of course, eating. We only realized that 2 hours had gone by when the staff began lighting the evening candles, signaling that dusk was upon us. I smirked at how discretely the bill was presented to us (ironic that talking about money in rich circles is considered philistine!) 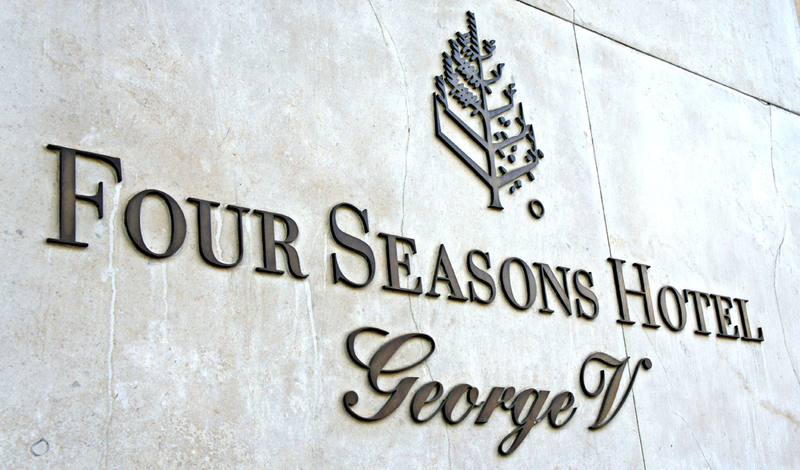 and picking our bags from their pedestals, we left the plush confines of the Four Seasons Georges V to join alas, the real world.